You’re reading this because you’re thinking about becoming a traveling physical therapist, or you’re already a traveler who wants to know more. Congratulations! You’ve chosen a completely unconventional way to live and you’re not accepting normal. Before you started PT school, you probably knew nothing about travel physical therapy. Then you went to a conference or a job fair and met a recruiter, one of your classmates mentioned travel, or you saw a video online about travel PT. Your interest was piqued, and now you’re reading this book. I’m writing this book for several reasons. There are misconceptions about travel physical therapy - The advantages and disadvantages, how much it pays, the difference between permanent jobs (“going perm”) and travel jobs, and how to find the best travel jobs. There’s a lack of good resources about travel physical therapy, even on the internet - Much of the information is provided by recruiters themselves. Most of that information is reliable, but it’s biased, and no recruiter I know has ever been a traveler. NewGradPhysicalTherapy has released several articles in the past year to educate PTs about travel, and I recommend you read all of them. 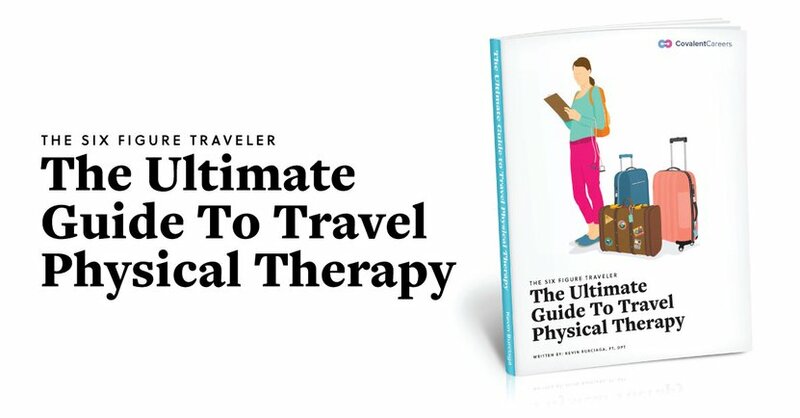 This e-book aims to provide everything you need or want to know about travel PT, and should be the ultimate guide to traveling physical therapy. The information that is currently available is disparate - There is no central resource for travel PTs and I wanted to create an essential guide. My hope is that this book becomes a resource to which you refer frequently, and that one day you can make six figures traveling the country. I don’t know why you are considering traveling physical therapy. Maybe you want to travel and see places you’ve never seen. Maybe you want to make a little extra money to pay off those student loans as quickly as possible. Maybe you like the itinerant lifestyle. Maybe you don’t want to be conventional. I don’t know what it is. The fact is, you’re reading this because you want to travel, are already traveling, or are at least considering travel PT. I wouldn’t want to travel to different places every three to four months, live with other people, and drive across the country. I didn’t consider travel PT for two and a half years. It wasn’t on the radar. A couple of my professors and former classmates told me that employers demanded more from travel PTs. They said I would have to “hit the ground running” and that there would be no mentorship. They told me that it wasn’t for new grads and that I should get a year of experience first before I started to travel. Some of these claims were true, and some weren’t. The only way to find out was to become a travel PT myself and see what was true, and what wasn’t, and to get the facts. As I write this book, I’ve been a travel PT for a little over a year in four different states in five different cities, and I’ve worked with multiple recruiters. I’ve learned a lot since I was a neophyte. This game is filled with trade-offs, and you are not always going to get everything what you want. Your “dream job” probably doesn’t exist, and you’re going to have to accept trade-offs. Every job will have disadvantages. But if you play the game right, you can find better jobs in better locations, and even make six figures doing so. As far as I know, this is the first comprehensive e-book on travel PT. When I was in PT school, not too long ago, there was very little quality information about travel PT. There were videos on YouTube, but NewGradPhysicalTherapy was still nascent had not yet covered the topic. Student Doctor Network had a few threads on traveling. My point is that information on travel PT was limited, unreliable, and scarce, and even in 2017, it still is, a few blogs and Facebook groups notwithstanding. There were certainly no e-books that I was aware of. I hope this book becomes a valuable tool and helps you decide whether or not you want to become a traveler. If you do choose to become a traveler, then this book should help guide you. Want this as an ebook? Download at the bottom of the page! The portion of the book I wrote is the culmination of my hours of thought and introspection. Just as Leonardo da Vinci would stare at a blank canvas for hours before he started to paint, I thought about this book for many hours before I started to write. More and more physical therapists are traveling. It’s nothing new, but there have never been more opportunities, and finding those opportunities has never been easier. The economy is evolving, and the modern worker needs to be flexible and adaptable. Permanent jobs are harder to find and they pay less. Temporary jobs are more common, and they often pay more. Yes, it would be nice to live in one place and make a good income, but the labor force is becoming more and more flexible, and working and living in one place for 30 years has become a 20th-century concept. Today’s economy rewards flexibility more, and consistency and comfort less. We love technology, we love communication, and we don’t like to stay in one place for longer than 6 months. We grew up with the internet, and the internet has expanded options. We demand options. We also don’t want to wait, and if one job isn’t working for us, then we move on to the next job until we find what we want. Not everyone reading this book is in the same situation. Some of you might be in PT school and you’re considering traveling. Some of you might have a permanent job and now you want to venture out and explore the country. Some of you might be experienced PTs, and now the kids are gone, and you can finally travel. I don’t know what your situation or motives are, but you’re reading the right book. And regardless of what your situation is, travel PT is still the same game, and you need to know how to play it. Most travelers are new grads looking to make extra money to pay off their loans as quickly as possible, but this is not always the case. Some travelers have been on the move for many years and have become veterans. Other travelers are experienced therapists who want to travel and never had a chance. It doesn’t matter where you are in life. I’m going to start this chapter by saying that traveling physical therapy is not for everyone. You have to decide whether or not it’s a journey you want to make. It can be fun, exciting, and can take you to new places, but not everyone should do it. In this chapter, I’m going to explain the pros and cons of traveling, who should do it, how long you should do it, and considerations you need to make. If you’re in PT school right now, you don’t need to decide until you graduate and pass your board exam what you want to do. I’m sure recruiters and clinic owners are calling you right now to discuss the latest openings. They’re happy to secure a position for you. The last time I checked, there were a few videos online about travel PT, but some of them are from 2009 and 2010, which means there still isn’t a lot of information out there. Now you have this book. Traveling requires certain traits and attracts a certain personality. Flexibility - You have to be able to move to a new place in one weekend. You have to change your residence every three to four months. You will probably live with other people. You might have to work in different environments. You might have to work on weekends. Wanderlust - The Germans call the desire to travel "wanderlust," and a traveling physical therapist must have it. If you like stability (see below), then you’re not going to enjoy travel PT. Open-mindedness - You’re not going to live in the best zip codes of America. You might not have your dream job. You might work in a rural area. If you want to live in a comfortable neighborhood in a nice clinic in a large metro area, then take a permanent job. You are going to work alongside people who are not exactly like you. Do you want to live alone or do you mind living with roommates? If you’re living with a roommate now, this might not be a big transition for you. It’s what you’re familiar with. I, however, lived alone the entire time I lived in PT school and didn’t want to live with others as a physical therapist. So I had to look hard for short-term housing, which is not impossible. I cover this more in the section on housing. I’ll say this right now. It’s much cheaper and easier to find a room to rent than to find your own place as a traveler. If you don’t want to spend a lot on housing, then learn to live with other people. Part of the appeal of traveling is that you get to see new places. One of the disadvantages is that you have to drive your own car, and sometimes you have to drive a lot. If you’re going to school on the West Coast and want to see the East Coast, or vice versa, that’s your car you’re going to be driving, unless you want to spend a thousand dollars to ship it. Most recruiters give you $500 for traveling expenses, but you will still need to drive long distances if you have an ambitious itinerary. You will have to drive from one assignment to the other. For example, I lived on the East Coast and wanted to move to Texas and see the West Coast. In 13 months, I drove 40k miles. That’s a lot of driving, especially for someone who lived two miles from school for three years. Do you have kids or are you expecting kids? What other responsibilities do you have? If you do have kids, I suggest that you delay your travel PT for now. Wait until the kids grow up and then start traveling physical therapy. I believe that your kids need stability. They should stay in one school, in one neighborhood, in one house, unless you absolutely need to move. Kids require sacrifice, as you know. I’m sure two PTs have traveled together with kids, but I don’t recommend it, based on what I’ve experienced. If you currently own a home and you’re paying a mortgage, you have to consider that, too. The mortgage payment isn’t going to stop just because you’ve decided to travel. If you’re renting a home, condo, or apartment, it is best to keep paying it for tax purposes, and a permanent residence is required to receive the best housing stipend. Yes, married couples travel together. It happens all the time. In some ways, it’s cheaper because you split the rent. Yet, there are some drawbacks worth mentioning. First, you have to agree on where to go. Of course, you and your spouse can go two separate places but that wouldn’t be too easy on the relationship, would it? You also need to find jobs in those areas. In a worst case scenario, one partner’s contract gets cancelled and the other’s continues. Traveling is much easier overall when you’re single. You can decide where you want to go, where you want to live, what you want to do on the weekend, and you can decide the length of the contract. If you like flexibility, be single. If you want to experience the country together and create unforgettable memories, then traveling as a married couple is an option. Marriage or engagement is not an impediment to travel. Are you a new grad, or do you have several years of experience? Regardless of how much experience you have, you can travel. You might not get the job you want, but an employer will hire you somewhere. If you have several years of experience in orthopedics, your chances of landing a good job are higher. If you have a little experience in everything, you might not get the jobs you want. If you’re a new grad, you will not have as many options. Don’t misunderstand me. New grads have gotten quality jobs. I have a little more than one year of experience, and I’ve had two excellent positions. The more experience you have, the more options you have, and the less competition you have. If you’re a homebody, then I don’t recommend travel PT at all. You will likely be miserable. If you like your home, your neighborhood, and your routine, then I recommend you find a permanent job. You can see new places on vacation, at weddings, or at conferences. Part of the appeal of traveling is that you see new places. If new places don’t interest you, then why bother. However, there is a compromise: you can be a traveler in one state and still make the money of a traveler. That way you’re never too far from home. But traveling to new places is a primary motivation for many travelers. This question is a sequel to the last question. If you’re a homebody, then you probably like stability too. They go hand in hand. If you want to live in one place, live a conventional life, and have a typical routine, then do not travel. If you like the consistent routine, don’t want to look for a job, and think learning a new system every three months sounds like a huge hassle, then don’t travel. If you want to have permanent friends and build a social network in one area, then don’t travel. When you decide to travel, you will automatically sacrifice stability in your life. Can you handle the logistics? One disadvantage of travel is that you have to be able to handle logistics: finding a new place to live, finding a new gym, making sure you have all your vaccinations, getting a drug test if necessary, getting fingerprints. The credentialing process (see below) can be time consuming and frustrating. If you’re moving from one state to the next, then you will have to apply for a new license (see below) and make sure everything is organized. The last thing you want is for your application to be incomplete. Depending on the state, that would add weeks to the process. Do you have to live in a large metro area? Are you committed to a certain area? When I was in PT school, everyone seemed to know where they wanted to live. Some people wanted to move back “home” (the area where their family is or the area where they grew up); others wanted to move to a particular city; others wanted to stay in a particular state; others wanted to work in the area of the school. Everyone has a personal preference, but as a traveler, you need to be able to accept jobs in rural areas or less exciting cities: Columbus, GA, not Atlanta. Lake City, FL, not Tampa, FL. Tucson, AZ, not Phoenix, AZ. Abilene, TX, not Austin TX. Do you get my point? I’m not maligning these cities. They all have positive attributes, but many people don’t even know these cities exist. They’re usually smaller, don’t offer as many amenities or activities, have lower median incomes, and are not as attractive overall. As I’ll point out later, not all travel positions are in no man’s land. Some positions are actually near choice cities. But sometimes, the best cities are the ones you’ve never heard of! There are clearly a lot of considerations you need to take into account before you even decide to travel. Again, travel PT is not for everyone. I hope the list of considerations helps you make your decisions. As I said above, you will live and work in smaller cities. Traveling is not for people who want to live and work in one particular area. You will also need to be flexible when it comes to housing. Before I started traveling, I had the idea that I could rent an apartment for three months. While this might be the case in some cities, it’s not always, and you might have to rent a room in a house. You should be able to live alone and with others. You’re going to hone your interview skills because you’re going to interview every three or four months with multiple employers. If you work with multiple recruiters, then you’re going to be interviewing a lot three to four weeks before your next assignment starts. You need to be able to present yourself in an engaging way, answer questions quickly, and be so good they can’t ignore you. Make them an offer they can’t refuse. You will have to learn and master a new system every three months. No two systems are the same. I’ve worked with employers who have electronic medical records (EMR), and one employer who still used paper notes. Yes, paper notes in the year 2017! You will also have to learn a new routine. Your commute might be long or short, depending on where you live. Some cities won’t have the stores or amenities that you’re used to. If you need to live within five miles of Trader Joe’s, reconsider travel PT. No two cities are the same, and the locations of services is always different. Some cities have more or less traffic. Some cities don’t have every service you need. Others are three hours from an airport. Cost of living also fluctuates. Every three to four months, you will have to meet new people, make new friends, and meet new patients. It’s an advantage and a disadvantage (see below). You will have to say goodbye to everyone you met at the old clinic, and then move to another one and meet a completely new staff. You need to be able to make new friends, develop rapport, and be as amicable as possible. Go to case conferences, staff meetings, happy hour, and other social events. You need their help. Some travel jobs can be frustrating and, like any job, you might have to do things that are above or below your pay grade. You might work too many or too few hours. There have been plenty of instances where I was frustrated, but difficult times are like afternoon thunderstorms: they come and they go. The important thing to do is not complain. No one likes a complainer. This is true whether the job is permanent or temporary. Timesheets have to be submitted every week. You need to make sure you get your vaccinations every year. You might need to get a drug test every year, or a new drug test if you change recruiters (more in that in the recruiting section). You need to be able to comply with the state boards so you get your license in time. You need to be able to find new housing every time you move. Dealing with logistics can be a nightmare sometimes, so you need to be able to plan ahead. If you like to live in one area and don’t want to see the country in person, then take a permanent job and don’t travel, or consider becoming a traveler in one specific location. Everyone is different, and some people are content to watch National Parks and enjoy the country vicariously. The traveler must have a desire to see new places, live in new cities, and meet new people. It’s one of the advantages of traveling. If you have several states or cities you want to see, then you’re going to be traveling a lot and applying for a lot of licenses. More travel means more miles on your car and more logistics. It’s time to eliminate and clarify some misconceptions about traveling physical therapy. Travel PT has pros and cons, and I hope this guide helps you make a decision. It is true that you can work and travel at the same time, but you need to accept the disadvantages of travel PT. I’m not here to sell travel PT or to convince you to not do it. I’m not going to get rich writing this book. But the objective of this guide is to tell you everything you need to know about traveling. I want to make you know what the reality is. Recruiters will give you honest information, but they have never been travelers themselves.If you’re in PT school, you might be getting advice from your classmates or professors. Ask them if they have ever travelled. I was going to title this section The Good, The Bad, and The Ugly, but when I came to the Ugly part, I really couldn’t find anything to say. This is the most obvious advantage. As a traveler, you can truly live and work at the same time. In fact, they pay you to travel. Most recruiters will reimburse you for the miles that you drive. You might not stay in the most glamorous cities, but you can often find jobs in smaller cities that are only one or two hours from large cities. For example, I had a job in Tucson, AZ. That positioned me just one hour and forty minutes from Phoenix Arizona, one hour from the Mexican border, and only seven hours from the coast of California. Since leaving the East Coast, I’ve worked in four states and I’ve driven through seven other states. I’ve recorded all my adventures with a dash-cam and with my digital camera. Wherever I traveled, I had relatives. This gave me the opportunity to see family and friends whom I never had a chance to see during PT school. If all your relatives live in one area, then this might not concern you, but some of us, including me, have relatives scattered across the country. I deliberately, and strategically, planned my trip so I could see them. On weekends, I would visit them and I now have memories I would have never had otherwise. Working and seeing family at the same time: what a deal! When you visit new places, you meet people you would not otherwise meet. No place has the same people, and everyone has a different perspective. In every city I visited, I would go to a couple bars or restaurants, meet the bartenders, and talk to them. It was fun because I knew that only one copy of them existed and I could not meet them anywhere else. You will meet new patents in every place, and no two places have the same people. Your coworkers will be unique. The people you meet at the gym will be different. But you will notice that in many ways, people are the same wherever you go, and that generalizations are often incorrect. There are greater differences within a city than the differences between other cities. When you travel, you will visit places you have never heard of. Have you ever heard of Truth or Consequences, New Mexico? Neither had I before I started traveling. Did you know there’s a ski resort next to Tucson, AZ? There are so many places in this country to explore, and travel PT will certainly expand your perspective. There’s no need to travel abroad to explore new places. They’re right here, and you don’t need a passport. I worked in southwestern Texas for a while, doing home health. I came from an affluent area on the East Coast. The contrast was stark. I saw how some people live, and what life is like for other people. It really caused me to say to myself, “This is how some people live. I had no idea.” Traveling forces you to leave your bubble and realize that, no, a lot of people are not like me. It can be an eye-opening experience. If you change positions every three months, then you can work in a different setting each time. In theory, you can try four different settings in a year. This might not be possible, because it depends on the availability of jobs when you apply. But usually, there’s at least one job available in each setting. You can sample everything: skilled nursing facilities (or SNF), acute care, outpatient, inpatient (acute rehab), home health, and possibly even pediatrics (“peds”) and pelvic floor therapy (those jobs are available from time to time, but don’t count on them). If you work in every setting, you can see the pros and cons of each, and then decide where you want to work when you finally decide which setting to work in. You can see travel PT as a buffet. Take a little of everything and go back for more of whatever you enjoy most! If you worked in a different setting each time you started a new contract, you would become a versatile PT. If you can show on your resume that you can work in any setting in multiple states, you become more valuable than if you only worked in one setting. Working in one setting has its advantages too, but employers also like to see that you can adapt and learn new skills. Each setting has a unique set of skills and knowledge. If you’re in an outpatient setting, you will hone your manual therapy skills and your special tests. If you’re in home health, you will hone your logistics and documentation skills. If you’re in inpatient rehab, you will hone your knowledge of neuro rehab. 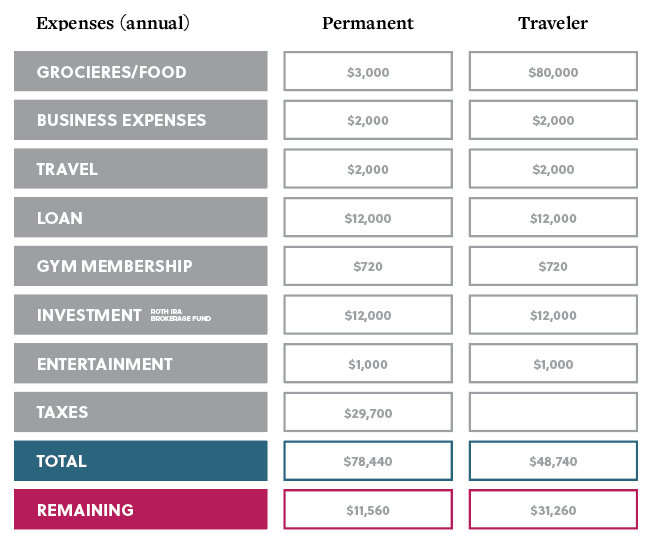 I’m going to discuss pay in a later section, but it is true that you make more as a traveler than as a permanent PT. You’re not going to be rich, but you will make more, which should mean a lot to those with six digits of loans to pay back. See the discussion of pay below for more details. There are some disadvantages of being a travel PT. I know the brochures show the most spectacular places in the United States: the Cascades of Washington; the forests of Alaska; the Rocky Mountains; the coast of California; the Great Lakes, etc. The perception is that you will only be going to the most beautiful places in the country. You will have the opportunity to visit those places while you travel, but many opportunities are not destination cities. This section includes the disadvantages of traveling, but I won’t discuss particular settings or locations. Some travel positions are terrible; some permanent positions are terrible. Travel PT inherently has some challenges that permanent jobs don’t have. It’s the nature of the profession, and even a great job in a great location won’t change that. If you want to work in a popular metro area (LA, NY, Chicago, Miami, Austin), perhaps you should consider finding a permanent position there. You need to keep in mind that many other people want to live there too. That’s why they pay less. Popular cities pay less and cost more. That’s a poor combination if you’re a new grad. In general, you’re probably attracted the same places as everyone else. It’s simple supply-and-demand. I will say that finding a job there is more difficult for a simple reason: employers don’t need to pay a premium to attract workers. People naturally gravitate to those large cities. Employers can pay them market rate and people will come. Some markets are so saturated that finding a permanent job is difficult: Pittsburgh, PA (four or five PT schools in that area), Charlotte, NC, and New York City come to mind. When finding permanent work is that difficult, good luck finding a travel job! Some PT jobs are in areas in which you might not prefer to settle down. They’re in the middle of nowhere and often have little to offer. Have you ever heard of Springfield, CO? It’s hours from the nearest big city and in the middle of the great plains. Another city that comes to mind is Liberal, KS. This job was presented to me in an email. It has the home from The Wizard of Oz. Another recruiter presented Globe, AZ. It’s an old western town in the middle of the desert. Few people aspire to live in these towns. While some PT jobs are in the middle of nowhere, many PT jobs are in what I call "second cities." They don’t have professional sports teams and lack the glamour of larger cities, but they offer everything you need, and you shouldn’t have trouble finding a place to live. A few examples include Tucson, AZ, Tacoma, WA, Fresno, CA, and Gastonia, NC. I did a contract in Olympia, WA, which was only 75 minutes south from Seattle via I-5. I took advantage of my location and enjoyed several trips to Seattle. Olympia was also an hour or two from spectacular geography, including the Puget Sound, Cascades National Park, Mount Rainier, and Mount Saint Helens. Living in Olympia was economically desirable, and I never had to put up with traffic. As a traveler, I’ve found that living in a second city is often preferable to living in the larger cities. There’s less traffic, and the cost of living is cheaper. A good apartment in a choice city like Seattle or San Francisco could easily cost $2k or more a month. In fact, in the Bay Area, $4k a month for a one bedroom apartment is not uncommon...$4k a month?! In a second city, that same apartment would cost half or less. These places have all the large big-box stores, but might lack higher-end stores like Neiman Marcus and Pier 1 Imports. That’s not a problem. You can drive to the large city if you need to buy something. After all, how often are you going to buy something at Neiman Marcus? If there’s a particular city you want to visit, I recommend you find a job one or two hours from the city, and then you can enjoy the city on the weekends and all its benefits, without all the traffic. If you want to see Washington DC, look for a job in Fredericksburg, VA, or Frederick, MD, both of which are only one hour from DC. You won’t have to deal with the congestion, which is horrible in that area, but you will still have the proximity. The point is, be flexible, and look for jobs in second cities. Remember, you’re taking jobs that are hard to fill, and employers are paying a premium for you to work there. They’re paying a premium for your flexibility. You get paid for doing jobs no one else wants. I do not mean that finding a job is difficult. It isn’t. There’s no shortage of clinics willing to hire a fresh new graduate. If you’re flexible, you will always have a job. In the advantages section, I noted that seeing new places, meeting new people, and working in a variety of settings are all advantages. Conversely, one disadvantage is the need to find a new job every three or four months. This means you will be on the phone a lot with the recruiter and also potential employers. If you’re working with multiple recruiters, then you will be on the phone a lot, and you will be exchanging a lot of emails. I will include more information on this later in the book. It’s enough to say right now that finding a new job can be a hassle. Three to four months can fly, and it seems like you’re finding a new position all the time. I’ve had recruiters call me the first week I’m on my job to tell me about an assignment that will be ready in three to four months. It never ends! As a traveler, your life will be changing three or four times a year, and consequently you will have to find a place to live. The internet makes this easier, but sometimes nothing is available. Finding temporary housing is a challenge. It’s much harder than finding permanent housing, and your choices are often limited. As soon as you’re comfortable in one spot, you’ll likely have to leave and go somewhere else. Don’t get attached to one place. You’re not going to be there very long. Changing location and beds several times a year can get old, and sometimes you will crave that stability. See the housing section for more information. I wrote earlier that if you are seeking stability in your life, then you might want to consider a permanent job. In my experience, lack of stability is the worst aspect of travel PT, but it’s the price you pay for getting paid more and traveling. Once you get comfortable in one spot, it’s time to leave again. This is the life of a traveling physical therapist: you’re a vagabond. At some point, you will wish you had a permanent place. You will think about taking a permanent position. Often people ask me, “Where’s home?” This question is hard to answer because, as a traveling PT, you will have two homes: your temporary home, and your permanent address (more on residence later). “Home” can also mean where you grow up! It seems like a simple question, but it’s hard to answer when you’re traveling. When you start a new job, you don’t know anybody. You meet people, and then you forget their names. Over the next few weeks, you hang out with them, have conversations with them, and you get to know them. Then one day, not too far in the future, the contract ends, and it’s time to say goodbye to the people that you worked with. It doesn’t take long to develop a relationship with people, and saying goodbye is emotionally difficult. It’s as if you have known these people your whole life, but really you were only there for three months. I’m not a sentimental person, but even I hate this part of my job. You might feel guilty because this clinic probably still needs your services, and now you’re leaving them and your patients so you can travel somewhere else to satisfy your own desires. It seems selfish to abandon a clinic that needs you to satisfy your own wanderlust. Everyone has goals, and you’re not evil for leaving. You fulfilled your contract and did your job. But you will feel this sense of guilt as you leave. The employer will likely make you an offer because they want you to stay. If you want to continue traveling, you politely say no. I remember one employer asking, “But who will see your patients now?” I can’t tell you how guilty I felt. I forgot how I responded, but I felt like I had let them down. There is one board exam: The National Physical Therapy Examination (NPTE). It’s the only pre-requisite to work as a traveling physical therapist. But there are 50 licenses, one for each state. This means you have to apply for a license in every state in which you want to work. When you apply for the NPTE, you apply for a physical therapy license in one state. But if you want to see new places, you have to meet the requirements of each state. Some states have online jurisprudence exams (Texas, Washington), and others have proctored exams (California, Arizona, Florida), which means you have to go to a Prometric center and take the test. It also means you actually have to invest time to study the laws so you can pass the exam. Even if the test is online, I recommend that you actually take the time to study the rules of that state. To make matters more complicated, each state has its own requirements for traveling PTs. Washington wants seven hours of HIV training. Nevada wants a letter of recommendation. Oregon only meets four times a year to review applications. Louisiana wants to meet every applicant in person. There are probably more bizarre examples, but you get the idea. You have to go to the website and carefully review the requirements in each state. I italicized carefully because if you miss one thing, you could delay your application for several weeks. Recruiters are there to help you navigate the process. Completing the requirements means you might have to visit a notary public, get fingerprints, fill out an application, and then ask each state in which you have a PT license to send a verification to the state you’re applying to. If you have licenses in multiple states, this means you will have to ask and pay each state to send a verification. You need to ask the Federation of States Board of Physical Therapy (FSBPT, the organization that writes and administers the NPTE) to send your scores to the state you’re applying to (for a fee, which is $80 at the time of this publication). The best way to deal with the license process is to set aside one day to complete all this bureaucracy. As I write this book, there is a movement to create a confederation of states that have one license. This would help tremendously, but the confederation would need to include 10 states to go into effect. So far, I believe only Oregon has joined. In the meantime, you still have to apply for a license in Oregon to work in Oregon. Once you have your license, you’re not done. Then there is the credentialing process, which is a long and tedious process. This process involves the recruiter verifying that you are who you say you are, and that you have met all the requirements they have. This means you will need to get a urine test, vaccinations, possibly fingerprints, fill out forms online, go to the notary public, complete a skills questionnaire (which could take up to 30 minutes, but it never seems to end), and maybe complete online training. You could spend an entire day doing this. Good luck you if you change recruiters - you’ll need it! The credentialing process starts over again. A urine test with one recruiter is meaningless with the next. You must repeat the process. At some point, you will ask yourself, “Is traveling physical therapy really worth it?” But welcome to our regulated world.If you do change recruiters, I highly recommend you give yourself a three day weekend. Many times, Quest Diagnostics and other labs will not be open on the weekend. If you’re not changing recruiters or states, then the transition to the next job will be much easier. If you’re changing states and recruiters, you have bureaucracy in front of you. It’s part of the job as a traveling PT. Take it or leave it. One advantage of travel PT is that you can work in different settings every three to four months. Great, but this means you could be sacrificing expertise. If you want to hone your manual skills or pursue a residency in orthopedics one day, then you shouldn’t change settings; you should really try to find jobs in one setting. It depends on what you want. You can pick and choose things that you want as a traveling physical therapist, but it’s hard to have everything. The first part of this book helped you decide whether to become a traveling physical therapist. You have to add up all the advantages and disadvantages and make a decision. This part of the book assumes you’ve made the decision to become a traveler. Now it’s time to find your first position as a traveling PT. I recommend you look for your first job after you’ve graduated and after you’ve finished the board exam. It’s okay to talk with several recruiters and have preliminary discussions. They can give you information about traveling physical therapy and the pay you can expect. The first question is, “Do you need a recruiter?” There are pros and cons to having a recruiter, but overall, I think the pros outweigh the cons. They aren’t there just to siphon off your money. They actually can provide valuable services. The recruiter can find traveling physical therapy jobs that you can’t. The recruiter is basically an intermediary between you and employers. You tell the recruiter what you want, and the state you want, and the recruiter goes and finds what’s available. Every recruiter has a different list, but some employers have contracts with multiple recruiters, so don’t be surprised if different recruiters refer you to the same position. If you develop a good relationship with the recruiter, your recruiter will work harder for you, negotiate more pay, and find better jobs. I think it’s essential you develop a strong relationship with at least one recruiter. He or she will work for you every day, even when you’re not looking. The relationship is important, as I make clear below. You want a recruiter who will call or email you at 10 PM. They’re not creepy, they’re working for you. That’s the kind of recruiter you want when you’re working in the traveling physical therapy world. Staffing agencies often pay for licenses, travel expenses, and the credentialing process. If you apply for a license in a new state and go through a recruiter, they will reimburse you, even if you don’t have receipts (keep the receipts, or copies of the checks you write, just in case). But I have estimated the expenses of the license and have been reimbursed for everything. Medical benefits. If you choose to find a traveling PT job on your own, you need to find your own medical coverage. Recruiters will often offer not just basic medical coverage, but also dental, vision, and catastrophic hospital charges. They deduct this from every paycheck and they make it ridiculously simple. It’s much easier than using state healthcare exchanges. In fact, I would just avoid the exchanges all together. A note about medical care: if you change recruiting companies, you have to apply for medical coverage again. Your coverage will not transfer from one company to the next. And according to the Affordable Care Act, you have to have medical coverage or else you pay a fine (the Supreme Court in 2012 called this a tax). If you’re under 26, you can probably stay on your parents’ medical coverage. (*Editor’s note - as we all know, the healthcare landscape is changing immensely under the new administration. Please do your due diligence and inform yourself about your own insurance eligibility/availability of ACA if/when you decide to travel). Remember, recruiters make money only when you sign a contract, and the less you make, the more they make. They’re not evil or nefarious; they’re trying to make a living too. But if you negotiate your own contract without the middle man (that is, the recruiter), you might be able to make a few hundred more a week. Of course, this can be resolved with good negotiation skills.If you’re a savvy negotiator and personally know clinics that need traveling physical therapists, then perhaps you don’t need a recruiter. But not using a recruiter is like selling a home without an agent: nobody is supporting or advising you. The constant search for a job. If you work with recruiters, they will constantly send you emails, text messages and phone calls. They will ask you about your current assignment and where you want to go next. This is fine, but you feel like the process never ends, especially if you sign three-month contracts. The search never ends. Recruiters will call you as soon as something opens for your next start date. I titled this section ‘choosing a recruiter’ as if you can only choose one recruiter. I had the misconception before I started traveling PT that I could only choose one. In fact, you can change recruiters every assignment. There are reasons I advise against this, and I will explain that in a minute. My point is, you can work with several recruiters or just one recruiter. There are advantages and disadvantages to both. You can interview several recruiters and then choose one. One advantage is that you will make fewer phone calls and send fewer emails when it’s time to find a new traveling physical therapy job. If you’re only working with one recruiter, the process is much simpler. Another advantage is that you don’t have to complete the credentialing process when you start a new assignment. Changing recruiters can be a hassle, and you will spend hours of your time completing the same process that you completed when you started the last assignment. This is one reason you shouldn’t change recruiters every three or four months. On the other hand, if another recruiter has a job you really want, then you will have to endure the credentialing process again. If you choose one recruiter because you don’t want to deal with multiple recruiters and make the process easier, then I completely understand. However, you have to have a lot of trust in this recruiter and assume he or she is going to find you the best traveling PT position. The obvious disadvantage of one recruiter is that one recruiter will have a limited selection of jobs. Some recruiters have a lot of jobs in some states, and nothing in other states. Another recruiter might have the job you’re really looking for, but your recruiter doesn’t have access to it. If you work with multiple recruiters, you will have a wider selection of jobs. As I said previously, some employers work through multiple recruiters, so there is some overlap, but not all recruiters have the exact same list of traveling physical therapy contracts. Having multiple recruiters will allow you access to multiple lists of contracts. This is important when there isn’t much time between contracts, or when you need a job immediately. The other advantage is that you can negotiate more if you work through multiple recruiters. If one recruiter offers $1500/week, for example, and the other recruiter offers you $1400/week, but has a better position, you can say that one recruiter is offering more. Finding a job then becomes a game. The point is, having multiple recruiters compete for you is a great feeling, and you can negotiate more pay. You’re making the recruiters compete against each other, and you ultimately win. The disadvantage with working with multiple recruiters is that the job process will be more complicated, and for two weeks you will be on the phone all the time. Finding your next job will almost become a full-time job. Each recruiter is competing for your signature. Your voice mailbox will be full, and you will have to arrange more interviews. It feels good to be wanted, but the job process can be a distraction. You also will feel bad when you tell the other recruiters that you have found a job. Only one recruiter can win, and telling the others that they are losers is never fun, especially when they’ve done so much to find you a job. Life is tough. With so many healthcare recruiters out there, how do you choose one? I’m going to guess there are over 100 staffing agencies for traveling physical therapy, maybe even more. A new one sprouts up every week. Traveling physical therapy is a growing industry and there’s no shortage of cheerful recruiters who will find you a job. Go to a job fair or a conference and you can easily collect 20 business cards from different travel PT recruiters. I’ve met at least two dozen recruiters and I regularly talk with five different ones. They work overtime for you. I have a couple recruiters who send me emails at 10 PM and call me well after business hours. This means they really want, and deserve, my business. Everyone has a life, but you want a travel PT recruiter who will go farther to get what you want. Don’t think they’re crazy; it just means they really want you. They remember your birthday or other important dates in your life. A good recruiter is like a good boyfriend or girlfriend: they remember important dates in your life even when you don’t think you told them. I have a recruiter who sent me a birthday card. They’re not buying my business or bribing me, but a good recruiter wants to develop a relationship with you. Travel PT is a business of relationships. The better your relationships, the better your experience will be. Develop them immediately. They know how to follow-up, or call you after you’ve found a traveling physical therapy job. Good recruiters should call you periodically to see how your current contract is, where you’re going next, and what your preferences are. They’re not annoying you, but they need to remind you that they’re working for you and let you know what the latest offers are. When they call, pick up, and when they need information, send it to them. Don’t ignore them. Good travel PT recruiters respond to your messages as soon as possible and don’t delay. With smart phones, there’s no excuse for dragging one’s feet. If you have a problem or a question, do you want to wait several days for an answer? If you’re a millennial, you want it now. Choose a travel PT recruiter who’s paying attention. They have a strong presence on social media. Social media have become a powerful way to connect with customers over the last 10 years, and good traveling physical therapy recruiters understand that. They should at least have profiles on LinkedIn and Facebook. Good travel PT recruiters are constantly seeking attention on these media with posts, pictures, and job offers. If you respond to a post, they usually respond immediately. One time, I responded to a post on LinkedIn and the recruiter called me within minutes. That’s a good recruiter. Good travel PT recruiters understand that they need to be consistent, but they also need to provide quality content and relevant information. They know how to answer your questions. They know about license processes in different states, what’s available, and give you good advice. They know where to find the best paying jobs, and can help you avoid bad jobs. With at least 100 staffing agencies and growing, there are plenty of poor recruiters. Unfortunately, there’s a high turnover rate in this business. I’m not a recruiter myself, but I have some idea why this is true. Bad recruiters check in on you once every three months and expect your business. They know nothing about follow-up and consequently never do business with you. They only care about you when you’re ready to sign a new contract. At some staffing agencies, a different recruiter calls you every time. As an example, I’ve talked with four different recruiters from a single staffing agency, whose name I will not divulge. Needless to say, I’ve never done business with them, because it’s impossible to create a relationship with them. It also creates the impression that they’re disorganized. They offer you much less than you can earn. If everyone else is offering a traveling physical therapist salary of $1500/week (after taxes, or “take-home pay”), and one recruiter is offering you $1300, you know who to eliminate and with whom you shouldn’t do business. Recruiters are making money too, but they should not be ripping you off, and they should not think you’re ignorant and stupid. They do nothing on social media. If they’re not using social media consistently, they don’t understand business, they don’t know how to attract leads, and they’re not publishing new content. A bad recruiter has a list of leads, calls them once, and then forgets them. It’s not a coincidence that I never see bad recruiters on social media. If I do, they’re sporadic and their posts are boring. If I meet a travel PT recruiter, I want to see his or her profile on LinkedIn. They don’t listen to you. You tell them one thing and they offer you something completely different. In another case, they don’t care what you want, and seem only interested in making a sale. These recruiters are flat-out obnoxious, and I wish I knew a way to politely tell them to go away. For example, I had a recruiter who submitted me (submit means to send your resume to an employer) to several jobs two months before I even graduated. I thought it was annoying, and it was a waste of my time. He set up interview after interview with clinics where I would never work. I never accepted a job because I didn’t have my diploma, nor my license. Don’t let recruiters do that. If you are in school right now, politely tell them that you want to finish school, study for and pass the board exam. Once you get your results, you can start talking and negotiating. It won’t take long to find a traveling physical therapy job. I estimate three to four weeks at most. If you go to a job fair or a conference, it’s easy to give your information to a dozen different recruiters, and now you have a dozen recruiters who want your business. Your inbox will now be flooded with job opportunities and you will get at least two phone calls a week from recruiters. Yelp.com and Angie’s List won’t help you choose. Even these days, word-of-mouth and personal recommendations are still the most powerful way to find a good recruiter. NewGradPhysicalTherapy has included a list of awesome recruiters at the end of this book. The qualities of good and bad recruiters above should help you decide. Compare the lists to the recruiters. Do they ask questions to figure out what you want? Do they send you information through email? Don’t choose just any recruiter, and don’t rush to choose the first one you meet. In this section, three recruiters from different parts of the country answer some questions about recruiting. I’ve offered my opinion on recruiters in the section above, but I want you to hear what recruiters themselves have to say. Again, everyone has a different perspective. I’ve reviewed these answers and I know these recruiters personally. I don’t think they’re trying to “pitch” anything. Their insight and advice should help you choose a recruiter. Of course, I’m sure they would love you to do business with them! I would personally recommend any of these recruiters. If you choose to work with them, I will not make any commission. I’m not an affiliate. What’s the benefit of a travel recruiter? What can a recruiter do for you? What are characteristics of a good recruiter? "At the end of the day, everyone likes to be employed. [First], a recruiter must be able to deliver and get you results (get you a job). Other important qualities are for a recruiter to be transparent, honest, communicate, knowledgeable, results oriented, urgent, personable, and friendly. "- Veronica Perez, Aureus Medical. How do you choose a recruiter? "If you're starting from scratch with your search of a travel PT recruiter, then I'd say if your job requirements are fairly flexible and you're available within 60 days, your recruiter should be in constant communication with you or have you speaking with managers ASAP. If you feel like this is not happening, then move on and find someone that does take your time seriously. But also set expectations with your recruiter and your recruiter should do the same with you. That way, you both know what to expect. It's crucial. "- Veronica Perez, Aureus Medical. How do you know which recruiter(s) to choose? Are recruiters worth the cost? Do you recommend working for one or multiple travel PT recruiters? What questions should a traveling physical therapist ask during an interview to make sure it’s a good job? What advice do you have for new grads during the interview? What mistakes do new grads make when they travel? When you apply for the NPTE, you will have to apply for a license in one state. When you pass the NPTE, the FSBPT will receive your scores, forward them to the board of the state in which you applied, and then you will receive your license. This process could take several weeks, and might take longer if your name is lower in the alphabet. The state in which you choose to apply for your PT license depends on several factors. First, will that state allow you to take the board exam before you finish all your classes and graduate? Only some states will allow this, including Ohio, Texas, and Virginia. Other states, including Florida and California, want you to finish all your classes before you can even apply. If you’re not taking the board exam until you graduate, then this doesn’t matter. You can apply in any state after you graduate. Another consideration is where you want to work first after you graduate. Only you can decide this question, but if you want to start your physical therapy career in New England, then you need to apply for a job there and start traveling there. You only need one license to start practicing. If you’re from California, however, and want to see other places, then obviously you would not want to apply to your own state (unless you want to be a traveling physical therapist in your home state to stay near your network of family and friends). Keep in mind that the cost of a physical therapy license is more or less the same in each state. It doesn’t vary between states. A license in California costs almost the same as it does in North Dakota. But the value of a license differs in each state. Consider that California could have 50 or more available traveling physical therapy jobs, while North Dakota might have one or two. But you’re paying the same in each state. In other words, getting a license in California will give you access to many more travel PT jobs than a license in North Dakota. A physical therapy license in most states costs between $150-250. The cost of transferring your NPTE score from the FSBPT to the state in which you’re applying is $82. You must do this each time you apply for a physical therapy license. You also have to request each state in which you already have a license to verify your license. This costs between $15-50, depending on the state. If you have licenses in two states and want to apply for a license in a third state, you must pay two boards to verify your license. Some states have a proctored jurisprudence exam. You have to pay Prometric $25 to go take an exam. If you live in a small town, this might be a problem since you will need to drive somewhere to take the exam. Most Prometric centers are open on Saturday mornings. States that have proctored exams include Arizona, California, Florida, and Nebraska. Some states want your application to be notarized. You have to find a notary public in your town, sign the form, and then the notary will charge you $10-25 for signing the form. You have to send your physical therapy license application by snail mail. As far as I know, not a single state accepts online applications. Postage should only cost $2-$5. The total cost of applying for a new state physical therapy license will depend on how many licenses you already have and whether there’s a jurisprudence exam for the new state. Fortunately, a travel PT recruiter should cover this cost (see above). Keep your receipts and send the bill to the recruiter. If you get a job without a recruiter, you eat the cost. Every state has its own idiosyncrasies and its own requirements. Some want fingerprints, while others don’t. Some want a notarized document, others don’t. Some have a proctored jurisprudence exam, others don’t. No two states have the same requirements, which makes applying for a license tricky. If the state has a proctored exam, then make sure you study. The laws in each state are not the same. You need to print and read the practice act of the state, as well as the rules and regulations regarding physical therapy that state. How many PTAs can a PT supervise? What is the definition of “direct supervision” and “indirect supervision” ? What are the roles and responsibilities of a PTA? What are some facility ownership considerations? What are the roles and responsibilities of aides, foreign-born PTs, and students? What is involved with legality of welling products and receiving a commission? What is legal regarding patient records? Are romantic relationships between PTs and patients allowed? If you study for these exams, you should pass on the first try. California seems to have the most difficult exam because it has the most rules and regulations to read. It’s 50 questions, but they don’t say how many correct answers you need. If you can pass the NPTE, you can pass this exam. But don’t wing it. Most licenses are valid for one or two years, depending on the state. I’ve applied for licenses that are only valid for eight or nine months, which gave me enough time to practice in the state for three or four months and then leave. Renewing it can cost between $100-$200. If you don’t renew it, then it becomes inactive, at which point you have to renew it, but you don’t have to reapply and take the jurisprudence exam again. If you’re a traveler, you’re going to collect licenses like baseball cards. Only keep licenses you need. In the "advantages of travel PT" section above, I mentioned that one advantage of being a traveling physical therapist is paying fewer taxes. Because half of your income will be a stipend for incidentals, meals, and living expenses, only half of your income is taxed. There is a difference between a tax base and a permanent residence. Your permanent residence is where you send all your legal documents: driver’s license, taxes, credit cards, etc. It’s the address you write on every form. The tax base is where you earn most of your income. Continue to pay rent at “fair market value” in that location, to continue to claim that tax base. Of course, you can always claim it as a tax base, work somewhere else, and hope that IRS never audits you. The IRS typically audits high-income individuals and not poor graduates, but you never know. If you haven’t met the criteria and the IRS audits you, you could owe back taxes. Instead of paying to rent a room, you are now paying the IRS. Don’t apply for a tax home. You can do this, and it’s perfectly legal, but you will pay all federal and state tax. You will make this option when you choose a recruiter. You can minimize this by declaring residency in a state with no income tax (Florida, Texas, Washington, South Dakota). If you don’t plan on having a tax haven, I suggest you do this. You will take less pay but you don’t have to worry about the IRS, and you don’t have to worry about living in your tax home for 30 days. Apply for a tax home, but don’t live there for 30 days and don’t pay rent. You can question the legality of this option, but I actually did this the first year because I didn’t understand tax law. I don’t recommend you do this. The IRS will probably not audit you, especially if you’re a new grad with no net worth, but if they do, they could ask you to pay back taxes, which would negate most of the financial advantage of traveling physical therapy. But you can take the chance, and if you win, you could make more while not paying rent or living in your home for 30 days. Apply for a tax home, and follow the rules. This is what most traveling physical therapists choose to do, but it has advantages and disadvantages. The obvious advantage is that you will pay less in taxes. In fact, half of your income will not be taxed because it’s provided in the form of a stipend. Another advantage is that you will comply with the law, and you won’t upset the IRS.The disadvantage is that you have to live in your tax home for 30 days, and pay rent that is equal to market value each month. For example, if you choose Atlanta, Georgia, as your tax home because that’s where your family or relatives live, then you would have to live at that residence for 30 days, and pay rent each month, even when you’re traveling in a different area. This means you will pay more for housing each month, and will consume the extra money you make as a traveler. I can’t make the decision for you. Each option has pros and cons, just like everything else in travel PT. I don’t recommend flaunting the law, as I did (unwittingly) in my first year as a traveling PT. You can’t leave your tax home, never return, and make the money of a traveler. I wish it were true, but it’s not. If your car needs an emissions and safety test every year, you need to take that into consideration. If you’re from an urban area, and you want to travel in the West, but the county requires an emissions test every year, you need to make sure you can get a new sticker on your car even if you’re not in the West. This depends on the county you’re from. Some counties are more lenient than others. Check your county rules. You don’t want to have to drive across the country just to get an emissions test. Your car is your ticket and it needs to be legal. Make sure you apply for residency in a state that makes sense. If you’ve never lived in Ohio, but want to establish residency in Ohio, you’re going to have a hard time convincing the government of Ohio that you live there. You need a place to send your mail, and you can’t just open a PO box or open a storage facility and keep everything there. If you want be a traveling physical therapist in Florida, find a relative who lives in the Southeast. That way, you can drive there in case you need to renew the registration on your car or need to work in that state to maintain residency. Each state has its own residency laws, so I would recommend that you research residency laws, and what it takes to maintain residency there. Because Florida has so many snow birds, I believe it requires that you live there for 182 days a year to maintain residency. Other states aren’t so strict. Applying for a driver’s license, registering to vote, applying for credit cards, and paying taxes will solidify your case that you permanently live that state. This sounds complicated, and even I don’t completely understand the technicalities. I recommend that travel PTs visit the website Travel Tax at http://www.traveltax.com/traveler.html. Ideally, all traveling physical therapists should talk with a tax advisor or a certified public accountant (CPA). If you make your permanent address a relative’s home or your parents’ home, then you can ask them to forward all your mail. Because your address is changing every three or four months, make sure they know you’re changing addresses two or three weeks before you actually move. You don’t want critical mail to end up at your old address. So far we have talked about everything except actually finding a job, a job that you have worked several years and paid tens of thousands of dollars to earn. You have your physical therapy license, you want to do travel PT, you have ton of student loans to pay off, you’ve chosen recruiter or recruiters, and you’ve decided where you want to work permanently. This depends on several factors. First, you have to decide in which setting you want to work. This can be a burning question for some new grads, but the good news is some positions allow you to work in more than one at a time. If you find one of these, take it! If your goal is to work in a variety of settings, ask your recruiter about these jobs. They seem to pop up all the time. Your goal might not be to work in as many different settings as possible. Maybe you only want to work in orthopedics or acute care. You can tell your recruiter that’s what you want. Keep in mind that if you apply for a license in a small state, your selection will be limited. If you apply for a license in a state like California, you should be able to find whatever you want. Be flexible. If you want to do orthopedics in one state, but nothing is available, you might want to consider applying for a license in another state where the license process is fast. Typically states in the Midwest and West move very quickly, and you can have a license in two weeks. You might want to wait two weeks to get that license, rather than settle for something in the state you’re in right now. It’s possible to work in just one setting in multiple states, especially if you like SNFs and home health. Acute and outpatient jobs are typically more difficult to find, or they require more experience. If you only work in one setting, you will not get variety. If you sacrifice variety, you will gain expertise in one setting. If you want to specialize in neuro, pediatrics, sports, or pelvic floor therapy, you will have a more difficult time finding work as a travel PT, simply because these jobs are looking for permanent PTs with expertise, but I’ve seen these jobs pop up once in awhile. I want to explain the process of finding a traveling physical therapy job and how it works. You don’t need a degree in health care administration to understand it, but it does help to understand how you find a position and how you get paid. Recruiters, working for healthcare staffing agencies, have contracts with various clinics and employers in every state. Some recruiters will have more contracts in certain areas of the country (Midwest, East Coast) but all of them should have at least one contract in every state. Clinics, hospitals, SNFs, and home health agencies submit their needs to the recruiters. When you call a recruiter, that recruiter will tell you what travel physical therapy contracts are available. They should tell you the setting and the city and location. Until you interview that employer, the name of the clinic is confidential. The jobs that recruiters have at any moment change every day. Contracts close, or the clinics find permanent workers and no longer have a need to find a traveling physical therapist. That’s why it’s a waste of time to talk about positions too soon. Those contracts could close any day. In fact, the contract could be cancelled after you’ve accepted the position. This is why I think you should have more than one recruiter (see "multiple recruiters: advantages" section above). You tell the recruiter where you want to work and what your preferences are. This isn’t like the military where you are told where to go and for how long. You tell the recruiter where you want to work, what setting you want to work in, when you want to start, and how long you want to work. Travel PT is flexible. Recruiters will come back and tell you what is available. You probably will not get exactly what you want. Traveling physical therapy is filled with trade-offs. The pay might be higher at one job, but the location might not be what you want. Another job might be in the ideal location (like Hawaii), but maybe it doesn’t guarantee 40 hours and you might not make as much money. You will have to compromise somewhere. Once in awhile, you will hit the jackpot. Recruiters get paid when you sign a travel PT contract and fulfill an employer’s need. The employer will pay the recruiter, say $80-100 per hour, for you to be there. Obviously this is a premium compared to permanent workers, who are generally paid between $30-50 per hour, depending on the clinic and employee experience level. The recruiter then pays you once a week. The recruiter takes a part of the money, since they found the job, support you, and are providing medical benefits. Keep in mind that the clinic itself is not paying you. Your paycheck will come from the recruiter. Because the employer is paying a premium, overtime is probably unlikely but not impossible. (see addendum at the end of the article regarding overtime). The contract specifically stipulates how many hours you can work. Some contracts have a minimum number of hours, and most of them will have a maximum. Only generous employers will pay overtime, but you shouldn’t expect it. The only way to supplement your income would be to find extra work on the weekends. Also, one reason to travel is to have the opportunity to see new places. If you’re working on the weekends now, when will you have the opportunity to go see family and actually see the place you’re visiting? If your goal is to pay off your loans as fast as possible, then travel and supplement your income. Except for the lottery, there’s no other way to pay off loans faster than working as a physical therapist. As the traveler, the recruiter will only submit you to travel PT positions that you want. You do not have to be submitted anywhere. The recruiter will send your information to the employer, and the employer will arrange an interview with you. Keep your phone with you and check your email regularly in this part of the process, especially if you’re arranging multiple interviews. Interviews usually last 10-20 minutes. An interview is an opportunity for the employer to make sure you’re a good fit, and also an opportunity for you to make sure this is someone you want to work for. If you have time, get the name of the clinic from your recruiter and check out the facility’s website to obtain information. This isn’t always possible because sometimes you only have two or three hours of notice. Technically, it’s not a question but every employer asks this. This is like interviewing for PT school. Keep in simple and short. Tell them where you went to school and what your life is right now. They don’t want a long story. They have other things to do. Get to the point and tell them one or two key facts about yourself. Tell them why makes you unique, why you’ve chosen to pursue travel PT, and why you’re a physical therapist. Tell them you like the setting and the location and that you’ve gotten good feedback about the clinic. Tell them the recruiter recommended it. Don’t say that you are applying because it pays well. How many hours are you looking to work? This answer depends on what you want. Obviously if you want to make money then you want a job that pays at least 40 hours a week, or no less than 35 hours. If you are want to go somewhere in particular and have plenty of time to enjoy it, then maybe you only want to work 30 hours a week. Do you have any experience in this setting? They should already know this since the recruiter has already sent this information to the employer, but sometimes they like to hear this straight from the horse’s mouth, so to speak. If you have experience, tell them what it is. If you don’t, tell them that’s why you’re applying to this job and that you’re willing to learn. They will only ask you a few questions, but you should ask more questions than they do. You’re going to be at this clinic for at least 13 weeks, and asking questions shows interest. Asking no questions is a bad sign, regardless of the setting you’re interviewing for. It shows lack of interest, lack of research on your part, and it makes you look flat-out boring. How many patients will I see in a day? You don’t want to be overworked. If you’re an outpatient setting, I think 15 is a good number over 10 hours. If you’re doing home health, then six to seven a day is plenty. Inpatient and SNF should be no more than 8-9. Acute care should be no more than 10. Ask this question now so that you’re not surprised later. I have one classmate who did not ask this question and now works 12 hours a day doing home health. Are there any productivity standards? Usually this only applies to home health, acute care, and SNFs, but it could happen in any clinic. If you’re interviewing with a travel PT position at a SNF, don’t accept anything higher than 80% productivity. Even that might be too high, but definitely don’t accept anything more. I’ve heard of hospitals with productivity standards as high as 93%. Remember, as a PT, you will have more paperwork than the PTAs. I know one traveling physical therapist who didn’t ask this question and ended up doing an extra two hours of unpaid work every day, just to meet productivity standards. Do you have electronic medical records (EMR) or paper notes? I don’t have official statistics, but I estimate that 90% of clinics these days have EMR. Don’t be surprised if you have paper notes, especially if you’re in a rural clinic. Some clinics are more traditional. Will I have to drive my own car? If you’re a traveling physical therapist, the answer is probably yes, since most home health agencies (HHA) don’t want a travel PT driving their vehicle. It’s too much liability. But it’s worth asking; in fact, I have worked for a home health agency that gave me, not the permanent PTs, a car. You should ask this question because you could be driving several hundred miles a week in your own car, especially if you’re in a rural area. You could also be in an urban area, which actually is harder on your car than rural driving. Will I need a laptop or will the facility provide one? I’ve never heard of a clinic that required its staff members to bring their own laptops. Some places forbid you from using your laptop, but most EMRs are in the cloud, which means you can access your notes anywhere you have an internet connection. In every traveling physical therapy assignment I’ve had, the facility has provided a laptop or a tablet. Will I have to see more than one patient at a time? You must ask this question. I didn’t and I ended up seeing 19-20 patients a day and saw two patients at the same time. You don’t want to do that, especially if you’re a new grad. You cannot provide quality care if you’re seeing two patients at the same time. Your patients are coming to see you, not the techs. They want your attention. If a clinic has to “double book” its PTs in this way, avoid the facility altogether. Do NOT take a job like this. If you’re working outpatient, only see one patient every 30-60 minutes. Most places do, but others don’t. If they do, tell them you love PTAs because you enjoy the collaboration and they make your job easier. Tell them you’ve worked with PTAs as a student and as a volunteer. In fact, the employer might ask you this question. Be positive about PTAs. You will be expected to work with them, and the majority of them are phenomenal at their jobs. Have you ever hired a traveling physical therapist?I ask this question to see if they have had good experiences with travel PTs, and to see if the job is appropriate for travelers. If they haven’t hired travel PTs in the past, it isn’t a deal breaker but I would feel more secure if they have hired travelers. The answer is probably going to be “no,” but I’ve been paid overtime in one job because I was driving such long distances. Overtime pays really well as a traveling physical therapist (usually time and a half). Ask if there are additional opportunities for income where you will be working. How many other PTs, OTs, and STs do you have? This gives you an idea of how large the operation is. I’ve interviewed at places that only had one physical therapist on staff, and I’ve been to other places where there were 42 therapists on staff. As a new grad, you don’t want to be the only PT on staff. You want someone else supporting you, and if you have questions, you want to be able to ask others. Also ask if the employer has permanent PTs on staff or just traveling physical therapists. I’ve worked in a clinic where all of the other PTs were travelers. That’s a bad sign. It indicates high turnover and ability to attract permanent talent. What are you looking for in a traveling physical therapist? They are probably looking for somebody I described above in the"the ideal traveling physical therapist" section. They want someone who is reliable, shows up on time, has a can-do attitude, pleases the customers, and can work with others. The answer is predictable, and when they describe their ideal candidate, tell them that’s exactly what you will be. Do you see patients in assisted living facilities (ALFs)? If you’re applying for a home health travel PT job, ask this question. ALFs can be challenging because they have three scheduled meals every day, and you will have to see those patients between meals. A lot of people are in ALFs due to dementia or cognitive impairment. If dementia isn’t your forte, consider another job. Most of these patients don’t have a direct phone line either, so communicating with them will be a challenge. Do you have permanent opportunities? This indicates that you might be interested in settling with those company and the company will be more interested. Only ask if you are actually interested in permanent opportunities in the future. Don’t lead them on. How much territory will I have to cover? Here’s another question about home health that I wish I had asked. My first assignment was in Southwest Texas, serving patients in rural communities. I covered seven counties and drove 500 miles in a week. Thank God for podcasts. I might not have taken that job if I had known that I would have to drive 500 miles a week, putting that kind of wear and tear on my own car. Would you consider extending an assignment? Extending an assignment has pros and cons. Extending means more stability, but it means you will experience fewer settings, meet fewer people, and see fewer places. It could also jeopardize your tax base if you haven’t been back to your tax base recently. Again, it’s a trade-off. Asking this question shows interest. The clinic might not want to commit to a traveler for more than 13 weeks. On the other hand, they might be hoping to extend the contract, so they don’t have to hire someone new in three months. Do you pay for charting time/paperwork time? When they say 40 hours a week, is that 40 hours a week treating patients, or is that total time? You don’t want to find yourself in a job where you’re seeing patients 40 hours a week, but then spending another 10 hours doing notes at home, and not getting paid.It's a dirty secret, but there’s a lot of unpaid work in this industry. Some clinics will say 40 hours, but will not mention the 10 hours of notes you’re writing. This is deceptive, but it happens all the time, especially in outpatient clinics. Make sure you ask the clinic if they provide documentation time. You will probably do notes during lunch, but if you’re going to write notes for an hour after the clinic closes, then you need to get paid for it. I find this problem to be more common in outpatient settings, where PTs will go home for one or two hours to finish notes. Don’t take one of these jobs. You should be paid for your work. This is more important if you’re a new grad, but all travelers should ask about this. You don’t want to have a full caseload on the first day, when you don’t know what you’re doing. Every employer is different. My first traveling physical therapy job trained me for a week on their EMR. On another travel PT assignment, I shadowed another PT for four visits and then I was on my own. Ask this question. You should see another PT complete at least one evaluation, one treatment, and one discharge. Am I expected to complete OASIS (Outcome and Assessment Information Set) paperwork? Most home health agencies (HHAs) make the nurses open the case and complete the OASIS, a long and tedious document about the patient’s current level of function and medical history. I’ve worked with HHAs that make the nurses do everything, and another HHA that makes the PT complete part of it. I’ve never heard of a HHA that makes the PT open the case. This can dramatically affect your pay, wear-and-tear on your car, and your hours you'll be working. If you're driving all over creation and can bill for the time, great! If you're paid per visit and you're driving all over town, plus expected to see 8 patients per day, you could wind up burned out very quickly. This is another good question. Generally speaking, either one can be fine, but it helps to understand what you're working with. If all of your cancellations are immediately filled with wait-list patients, but you only have 30 minutes of chart time per day (or worse, none - but you'll ask to make sure that you do get chart time), you might need to hustle quite a bit. Have these questions ready when you start the interview. Don’t wing interviews. Have a list of questions on an index card and ask them. Write down their answers, too, so you remember the answers. It’s easy to get details confused when you’re interviewing with multiple clinics. I wish I had asked these questions before I started some of my assignments. You don’t want to work in an outpatient clinic where you’re going to see 20-25 patients a day. Unless you know how to multi-task really well, you will not enjoy your job. If you haven’t done paper documentation, and you want to use EMR, make sure you ask during the interview. Don’t assume that every clinic has EMR, because even today, not all clinics use EMR. If you’re doing home health, make sure you know exactly what territory you will be covering and how many patients you will see in a day. The employer might say it’s a 40-hour week, but that might not include driving and documentation time. I’ve heard of home health PTs who have to do two hours of notes when they get home, and that’s unpaid time. Yes, time that you work should always be paid, but you can’t make any assumptions. Be sure to ask about these things. If you have no experience in a particular setting, then asking questions is even more important. Good questions can also separate bad employers from good ones, and can ensure you have a great experience as a traveling physical therapist, and really, in any PT job. You want to make sure you know exactly what the expectations are, and ensure that there are no surprises when you get there. If you can, ask the recruiter if you can talk to a previous travel therapist who worked there. A clinic might say they’ve received good feedback from travelers, but talking to those travelers directly is ideal. You should be selective when you look for a travel PT position, but don’t be too selective about the location. If you’re flexible with location, then you can usually find what you want. If you’re willing to work in multiple states and have multiple licenses, then your chances are even better. Ask these questions first and you shouldn’t have any problems. If the interview goes well, you like the employer, and the employer likes you, then the employer will notify the recruiter. The recruiter, in turn, will notify you. In this game, you usually have only 24 hours to notify the recruiter. The recruiter and the employer both want to know as soon as possible what your decision is. If you don’t respond, the employer could rescind the offer. If you’re only working with one recruiter at a time and you only interview with one position, then the process is as follows: You interview, you accept or decline, and if you decline, then the process starts all over again. If you’re working with multiple recruiters, then the process is more difficult, but as I said in the section about recruiters, you will have more options and you will have an easier time negotiating pay. If one employer offers $1500 per week and the job is ideal, but another recruiter offers $1700 per week and the job isn’t, you can tell one recruiter that another is offering more. The employer will not be asked to pay more. The employer couldn’t care less how much you make per week, since they’re not paying you; your recruiting company is. So really, by negotiating, the only difference is that the recruiter will make less. The recruiter takes the difference between what the employer is paying and what you make. He or she is the middleman, and makes money by connecting employers with workers. The recruiter will make an initial offer. The initial offer is designed to satisfy you and the staffing agency, not to maximize your income. If the initial offer satisfies you, then accept it. If you think you can make more because you have a higher offer, ask the recruiter to increase the pay by $200 per week. Tell him or her that another recruiter is offering more. By working with several recruiters, and interviewing with several facilities at the same time, you you have more leverage than if you only worked with one recruiter. Some recruiters are stingier than others. I won’t say their names but it’s not hard to find out. Tell them your minimum pay before the interviews start ($1500 per week after tax is a good minimum, especially if you’re in a rural or extreme area). If they can’t or refuse to offer that amount, then look for another position. There’s plenty that will pay you more than that in any state in any setting. If you want more, but no one else is offering it, then simply ask. This might be harder if you have no experience, but if you have experience, then ask for more. The lowest package (take-home pay, or pay after taxes) I’ve ever seen was $1350 for a job in North Dakota. If you’re going to accept a job in extreme locals (such as Alaska or the Upper Midwest, especially in the winter), you should ask for more. Those locations should demand a premium. Don’t think that because you’re a new grad, you can’t get a high-paying position. Your value is not only your experience, but your flexibility. You’re solving a problem. You’re filling positions that are hard to fill - ones that nobody wants. That’s why the employer is paying a premium for you to be there. Don’t be afraid to ask for more. I’ve heard of new grads earning $2,000 a week. It is possible. Your traveling physical therapy paycheck consists of two parts: the daily stipends and your hourly rate. The hourly rate is usually somewhere between $20-30 per hour, while the stipends should be at least $120 per day. You have two stipends: housing and incidentals. You should negotiate both of these, not just the final package. Housing and incidentals combined should be at least $120 per day. This is a daily value, not just Monday-Friday. If you earn more than $120 per day, you can apply for an additional tax credit to reduce your tax burden even more. That’s why $120 is a key number. If your daily stipend is $120/day and your hourly rate is $25, and you work 40 hours, then your total pay for the week would be $1840. Stipends are not taxed according to the IRS. Try to lower your hourly rate to $20/hour and then maximize the stipend. Understand that most recruiters are not trying to fleece you. Most of them seem honest. They want to satisfy you and do business with you, because, after all, you are the customer. But if you don’t know how to negotiate, don’t set a minimum, don’t interview through multiple recruiters, and you’re ignorant about the process, you could leave a lot of money on the table. When you do accept a travel PT position, the recruiter should break down the paycheck with you: the stipends, the hourly rate, and also the deductions. Also, make sure that the contract guarantees 40 hours (or at least 35) when you sign that contract, even if the employer can’t provide the work. Make sure you know how much you will make after deductions and taxes. Medicare and Social Security will take their share too, so it’s important that you do this. A good travel PT recruiter should break it down without you asking. I’ve done this in certain contracts. I find that some employers are more flexible than others. I recommend taking off at least one non-holiday weekday off each month. You never know when you’ll need to go to the dentist, see the physician, or have your car fixed. You will also have to choose which health care plan you want. The recruiter will offer you several options. Avoid the government exchanges. If you’re young and healthy, I recommend you get a high-deductible plan for catastrophic injuries and high hospital bills. You could be in an accident at any time. Comprehensive coverage is probably not necessary at this time. You can see the dentist as infrequently as once a year if you’re taking care of your teeth. If the travel PT recruiter offers disability insurance, take it. Physical therapy can be demanding, and it requires that you be healthy. It’s hard to do therapy with a bad back. If the recruiter doesn’t offer it, then find it somewhere else. I recommend you sign up as soon as possible. Accidents happen without warning. What you prepare for doesn’t happen. A note on taxes: when you do have to pay taxes, I recommend you consult an accountant, rather than use software like TurboTax. Also, if you work with multiple recruiters throughout the year, you will have multiple W-2s in multiple states. Accountants can also help you determine if you’re complying with tax laws, as well as whether you can claim an area as a tax home. Pay $100 and hire a professional. It’s worth it. When you have accepted an offer, tell the other recruiters and your current employer immediately. Don’t pretend that you’re entertaining other offers. Don’t waste the time of other recruiters. Everyone needs to be on the same page as soon as possible. Here’s a confession: I’ve waited two weeks to tell other recruiters because I didn’t want to reject them. I ended up wasting their time telling them that I had not taken a position. Rejection is tough, but if you’re working with several recruiters, it’s part of the game. Now it’s time for logistics. You’ve found a travel physical therapy job and negotiated pay, and now it’s time to find a place to live. In the advantages and disadvantages sections above, I said that housing was a disadvantage to travel PT. In this section, I’ll elaborate why and I’ll also show you ways to find cheap housing fast. As a traveling physical therapist, you will have a permanent residence and a temporary residence. One of the trickier parts of travel physical therapy is finding a place to live in your temporary locale. Most apartments and condos do not offer short-term leases, which makes your job a little more challenging. That apartment with the pool and the fitness center might be unavailable. One reason I don’t recommend that you work in an extremely remote area is that your housing options will be very limited. If the town you work in only has 1,000 people, how do you expect to find any place to live? You might have to drive 30-40 miles just to get to work. If you don’t mind a longer commute, this might not be a problem. But even small towns have rooms to rent, and might even have temporary housing. My first assignment was in a border town, called Del Rio, Texas. It only has 40,000 people, but I contacted a local realtor, who owned a quadplex (a home with four separate apartments) near my office. She offered a month-to-month lease and it was completely furnished for an affordable price. This in Del Rio, Texas! If you’re in a larger city, then finding housing should be easier. One thing you will have to decide is whether you want to live alone or you want to live with roommates like you did in grad school. As with most other parts of being a travel physical therapist, there are advantages and disadvantages of both. If you’ve ever lived alone, it’s hard to go back. You have privacy, your own kitchen, your own bathroom, and peace. You can watch TV whenever you want, and you don’t have to consider anyone else. You decide who comes into and out of the apartment. It’s the good life. After a long day, it’s nice to come home to peace and tranquility. You will definitely pay a premium if you choose to live alone. Short-term housing is not cheap, and you will pay extra for a short-term lease. A single-bedroom apartment can cost as much as $1500 a month, and then utilities can be another $150-200. Furniture can cost another $200 a month. If your goal is to be a miser and pay off student loans as fast as possible, I don’t recommend this route. Many apartments don’t allow short-term leases or month-to-month leases. Most want six months minimum. You can be deceptive and say you will be there for six months, and then pay a fee when you break the contract. I don’t recommend this, but it’s one more option. If you choose to rent your own place, you will have to go to the leasing office when it’s open and get your key. You will need to get a money order or cashier’s check from the bank. You will need to call the utilities to turn on your water, electricity, and gas. You will need to find a place to rent furniture. You will need to buy toiletries and cleaning supplies. You will need to call the cable provider to install your cable and TV. You will have to reverse this process when you move out. You will pay much less if you accept a roommate during your traveling physical therapy days. Your cheapest option is to find a room to rent. I’ve paid as little as $500 a month for my room, utilities, and internet. You could save as much as $1000 a month if you take this option. Housing is the largest expense for most people, including you. Minimize what you spend on housing. All you need is a bed and a shower. If you get lonely and like to spend time with people, having a roommate is a better option, because at least you have someone to talk to when you go home. If you’re extroverted, having a roommate is more appealing than living alone. If personal space is not important, consider having a roommate. Every neighborhood has vacant rooms, and they’re not as hard to find as finding a vacant apartment with a short-term lease. You have to do is ask people if they know about vacant rooms, and you can find one easily. Also, don’t forget to ask your patients if they know anyone with available rooms. Everyone is a potential lead. If you sign a lease, then you better be sure that you complete the contract. I signed a lease, the contract got terminated, and then I had to pay a fee to break the lease. I paid an entire month of rent to break the lease. Signing a lease can be risky, and it limits your flexibility. You might also find a better deal after you’ve signed the lease. You will experience some level of anxiety when you sign a lease, as well as 50 other documents. If you find a room to rent, you don’t need to take care of anything. You put your stuff in the closet and you’re ready to go. There’s no need for a cashier’s check, and you don’t need to turn on the utilities. Also, you usually pay with one check (or Paypal). You don’t need to pay for internet, utilities, and rent separately. You’re living in someone else’s home. If you did this in grad school, then this will be like being in grad school, except now you’re earning money, and you have loans. You will have privacy, but you will have to share a kitchen, the living space, and the driveway. If you absolutely must have your own place, then here my recommendations for finding an apartment. This will put you in contact with realtors in your area. Open a spreadsheet, and name column A ‘realtor’, column B ‘phone-number’, column C ‘contact’, and column D, ‘notes.’ Find five or six of these realtors. Call and email them and tell them who you are, what you’re looking for, and when you plan to move to your location. Realtors can find deals that you can’t find through search engines. They’re excellent resources, and they can often find exactly what you want. Do not use AirBNB or Homeaway. You will pay far too much to rent a house for a month. I’m talking up to $3000/month for a simple house. Avoid it. The only advantage is that you don’t need to take care of logistics when you do find a place. Utilities and internet are already included. Use these services for a few nights, but do not use them for longer than a week. Make a list of apartments. Type the name of the city followed by the word ‘apartment.’ Name column A ‘apartment’, column B ‘phone number’, column C, ‘address’, and column D ‘notes’. Sit down and call of them or leave a voice message and see if any of them allow short-term leases. Negotiate a six-month traveling physical therapy contract. Most offers are 13 weeks, but you can negotiate longer or shorter contracts. If you absolutely want to live alone, then try to negotiate a six-month contract. If you can stay somewhere for six months, you will have more stability than if you only stayed for three months, and you will have significantly more options in terms of housing. The disadvantage is that you will not be able to see as many places or work in as many clinics, and you won’t feel like a traveler anymore. You also have to start utilities and internet, rent furniture, and buy accessories to make the place livable. Like AirBNB, the cost of a hotel, even an extended-stay hotel, can be prohibitive ($1500-2000/month for a small room). This might be a good option for a week before you can find something else. I’ve stayed in a cheap hotel for a few days before I found something better. The advantage of corporate housing is that it’s usually furnished and ready to go. The monthly payment also includes the utilities and internet, which means you’re not going to get multiple bills each month. Corporate housing is hit-and-miss. I’ve stayed in a corporate housing that was ready to live in and was affordable. I’ve also stayed in corporate housing that had furniture, but not accessories. I had to spend $200 to make it livable. Some corporate housing can be very expensive ($2500-$3000/month). If you’re traveling to make more money, I don’t recommend this option at all. Have you never slept in your car? Then you don’t know what it’s really like to be a traveler! This is the cheapest and easiest option. Fifth Wheel Physical Therapist is an excellent resource for living creatively using this lifestyle, as he and his partner travel together in a fifth wheel camper. They're saving a fortune! If you have unlimited on your phone, you will have internet access. If you need wi-fi, stop at the local Starbucks and use their wi-fi. Don’t do this for longer than a few nights. Only do this until you find a better option. As you can see, you could be spending a large chunk of your paycheck on toiletries and household items. If you rented a home, someone else could provide it. You can take most of this with you when you move but you want to move with as little as possible. You can rent furniture at a Rent-a-Center or Aaron’s. Every city has one. However, a bed, a dresser and a nightstand alone could cost $200. A living room could cost even more. The point is, living alone as a traveler can get expensive. Your choice will depend on several factors. If you have lived with others in the past, then renting a room will not be a problem. If personal space is a sine qua non of your life, then you will have to find your own place. If you want to minimize your commute, then you will want to choose the place that minimizes your commute. If you want to save as much as possible, then rent a room. There are websites that connect roommates, including Roommates.com and Easy Roommate. Fill out your profile, pay the fee, and then you can connect with people who have extra rooms in that specific location. Of course, you will not know who these people are. The descriptions on the website only tell you so much. If you’re extroverted and like meeting new people, this shouldn’t be a problem. I like the concept of these web-sites, but I don’t recommend them to find temporary housing. I recommend them if you need a place to stay for a few nights, but not for several weeks. You will pay AirBNB a service charge, and most of the rooms rent for more than $50/night. This means one month will cost you $3000/month. You can negotiate, but no one is going to rent their room for $500/month. I also find that most of these rentals are in modest neighborhoods. Many home-owners associations in high-end neighborhoods have banned room sharing. I’ve used AirBNB in four different locations. I’ve never been impressed. This is probably the best way to find a room. You won’t pay a service charge, and you will know who you’re staying with. You can see the room before you commit. You’re not renting sight unseen (renting without seeing the apartment or room first). I’ve used this method, and it’s worked out well. I saw the place and I knew the person who owned the home. If you’re lucky, you will be in a location where you have friends or family who have an extra room. This is probably the best-case scenario, since you probably will pay a nominal (low) fee for the room; you will have time to spend with them; and you will be more comfortable living with people you know than living with strangers. Ask your recruiter if he or she has any positions available close to your family. I don’t like the idea of signing a three-month lease. I did this once and the contract got terminated after a month. I paid $1400 to break the lease. It was money down the drain. Do not sign a lease longer than one month. If you’re a permanent worker, this makes sense, but you need to maintain your flexibility as a traveler. If something happens, your recruiter isn’t going to break the lease-termination fee. I learned the hard way. You will not. It’s also better to get a feel of the area before committing. You want to know where everything is, how long your commute is, and what the good neighborhoods are. You don’t want to move somewhere, only to find out that there’s drugs in the neighborhood, that your commute is too long, that your room or apartment is too inconvenient, or that you don’t like the place you’re staying at. To maximize flexibility, don’t find housing until you actually arrive. Stay in a hotel (La Quinta, Days Inn) for a week, or find something on AirBnB, and then find your place to live while you’re there. Having completed four or five contracts, I can tell you this is your best option. It’s best not to rent sight unseen (renting without seeing the place and the area first), unless you absolutely have to. You want to make sure that the place you’re renting is a place you want to live for several months. It’s also easier to vet the owners of the room. Another advantage is that you can ask your co-workers if they have an extra room, or if they know someone who has an extra room. Even in this day and age of the internet, some of the best deals are found through word-of-mouth. Finally, if you give yourself a week to stay in a hotel, you will feel less pressure and anxiety when you move to the new location. You don’t want to have to deal with logistics the first week you’re there, or worry about finding a place to rent. Staying in a hotel gives you time. At this point, you are ready for your assignment. You’ve signed the contract, found a place to live, and now you’re ready to work. Starting a new travel PT assignment can produce some anxiety. You don’t know the electronic medical records (EMR) system. You don’t have a routine. You’re not sure what the procedure is. You’re not sure what to expect. If you have experience as a traveler, you will adapt faster. If you’re a new grad, you will probably be nervous because now you’re on your own. You’re no longer a student physical therapist with a clinical instructor (CI) holding your hand. Some companies offer training even for travelers. My first assignment was a great first assignment because my employer sent me to Oklahoma City for five full days of training on how to use the EMR, how to write notes, how to manipulate the schedule, and how to use equipment. Most employers will not do this. Most will show you how to use the laptop and the EMR once and then you’re on your own. I’ve had employers who provided no training at all. I shadowed another PT for three or four visits and then I started seeing my patients. During the interview, you want to ask about training (see the "interviewing as a travel physical therapist" section above) and see if the employer provides any. If you’re a new grad, the more the better. If they do provide training, have a notebook and a pen and write down everything they say. Your notes will be a handy reference when you actually have to write a note and you’re not sure what to do. A week before the assignment starts, you want to make sure everything is lined up and ready. Make sure you have completed all your tests, have gotten all your vaccinations, and have your original PT license (not a copy) with you. Contact your recruiter before the assignment starts and ask him or her if you need to do anything else. Who are you going to meet and where on your first day? What time are you going to meet the POC? What’s his or her phone number? Physical address and name of the facility. This sounds intuitive but double-check the name and address of the facility and find it on Google Maps or GPS. Find it the day before you need to work. Find the exact entrance and make sure you know where to park. What are you supposed to wear on the first day? I remember when I did a clinical at a hospital, and the day before, I checked my email and read that I needed to wear light-blue scrubs, when I only had purple. Obviously that wasn’t going to work. I bought new scrubs that day. If you’re in an outpatient clinic or rehab hospital, you will probably wear pants and a shirt. In any other setting, you will probably be able to wear scrubs, although I have worn scrubs in outpatient clinics. I discussed this briefly above, but how much training are they going to provide you? What EMR do they use, if they use EMR? Most facilities make you do some sort of HIPAA and sexual harassment training. Are you going to shadow, or follow, another therapist? Regardless how much experience you have, you want to shadow a therapist for at least one evaluation, routine treatment, and discharge. You want to make sure you see a therapist complete several notes on the EMR so you’re proficient with the system. If possible, ask a therapist to sit next to you as do your first note.It usually takes a week or two to develop a consistent routine and to become proficient with the EMR system. If you’re in more than one setting (inpatient/outpatient, home health/SNF), you might have to learn several EMR systems. As much as I love the multi-setting travel jobs, I don’t recommend those positions as your first traveling physical therapy job, because they can be frustrating. It’s easy to confuse the two documentation systems, on top of everything else you’re trying to manage as a new grad. If there is a problem with the documentation, somebody should alert you. It’s not the end of the world. Make a note of it and make sure you don’t make the same mistake twice. Keep a list of common mistakes you make and double-check every note. Every note and examination should be better than the last one, until they’re perfect. Documentation might be the hardest part of any new assignment, not the treatments or the examinations. With so many boxes and lines, it’s easy to forget something. Each employer has a unique process, and no two EMRs are the same. Some employers are more straightforward than others. Some require more steps than others. Some employers have an EMR, but also have several forms that you need to fill out. Keep a checklist of every step, and before you submit each note, make sure you have completed everything. I do this even after several weeks because it’s easy to miss a step. It takes an extra minute to make sure everything is correct. Some assignments have PTAs, and others don’t. This should be a question during the interview (see the "interviewing as a travel physical therapist" section above). Be flexible. Having PTAs has pros and cons. The pro is that you can focus on evals. If you have a patient with whom you don’t work well, you can give that patient to the PTA. Of course, don’t unload all your “bad” patients onto the PTA. But you aren’t responsible for every visit. The con is that the PTA might not treat the patient as well as you would like, or might simply use a different approach that you don’t agree with. Another con is that you have to constantly coordinate with the PTA. This becomes more challenging during home health than it does in other settings, where you and the PTA work in the same physical location. When the assignment is over, you want to have at least one good reference. Keep that in mind. One advantage of traveling physical therapy is that you will soon have many references on your resume. It’s okay to be frustrated once in awhile, but don’t complain. Before I started traveling, I was concerned about mentorship. Because I had never worked alone, naturally I was apprehensive. I heard a couple people tell me that they would expect me to “hit the ground running” as a new grad. I thought expectations would be higher for a traveling physical therapist. The truth is, your travel PT assignments’ employers will expect you to be a competent, responsible PT, but I don’t believe they expect more from a traveler than they do from a permanent worker. They’re paying a premium for you not because you’re expected to do much more, but because you’re filling a position that can’t be filled. Your assignment will probably require 40 hours of work, like most positions. I have not found that traveling physical therapy assignments are any more demanding than other positions. As for mentorship, it would be nice to have a mentor. If you have the internet, you have a mentor. If you know how to use LinkedIn, you should be able to find mentors in your field. Don’t forget that you have your former classmates, coworkers, and former professors. Plus, you are going to learn a lot on the job. Keep a notebook, make a list of your mistakes, make a list of things you need to improve, and make a commitment to become better each day. Become friends with your co-workers on day one. You need them, and you’re going to be working with them for several months. You need people you can rely on in case you need help. You don’t want to bother the same person every time you have a question. Getting along with your temporary colleagues will make your assignment much more enjoyable. Everywhere you go, you will meet new people as a travel PT. I’ve found that people are similar everywhere you go. The world has become so transient that some of your colleagues are not native to the area you’re working in. We often hear gross generalizations about people on the West Coast, East Coast, Midwest, and South, but there are more differences between people in one area than differences between people in two different areas. If there’s a social event, then go. It’s a great way to earn respect and develop friendships. Saying “no” is not a good way to integrate yourself. Go to bake sales, volunteer events, happy hours, meetings etc. with your coworkers. Ask them questions, be friendly, and let them know that you like being there. Don’t forget to collect phone numbers, in case you need them or want to hang out. Never eat alone when you’re a traveling physical therapist. Strangers have everything you want and need. You won’t find them at home. You want to be a traveling physical therapist who doesn’t just fill the position, but also one whom employers want to keep and recommend. You want your employers to be sad when you leave. If you get a job offer or an extension offer, take it as a compliment. When you leave, you should find at least one person to recommend you or be your reference for future positions. To summarize, you want to exceed expectations about both being a new grad and being a travel PT. Employers have shared traveling physical therapy horror stories with me, and I imagine they hesitate to hire travel PTs. They only hire them when the cost of having an open position exceeds the cost of hiring a traveler. Always arrive on time and finish work on time. Don’t allow notes to pile up. Don’t wait until the weekend to finish the notes. I worked in a clinic where another traveler had 35 incomplete notes by the end of Friday. How do you remember what you did for each visit? You don’t. So finish the notes promptly. This is physical therapy and attitude and people skills are just as important, if not more important, than your technical knowledge. You need to know how to develop rapport with your patients and with your coworkers. Learn how to make jokes and make conversation. I’ve heard people say, “you need to be interested and not interesting.” The truth is, be both! In fact, it’s impossible to be one without being the other. Interesting people are interesting because they were interested first. And if you’re interested in other people and new ideas, you will be interesting. Accept extra work and don’t complain. At some point you will work more than 40 hours in a week, and you probably won’t get paid for it. It’s a part of the job. Most PTs do paperwork off the clock. If they want you to see an extra patient, do it and don’t complain. You’re serving them, and they’re paying good money for you to be there. As a physical therapist, you will be working with other healthcare professionals, aides, managers, and the front desk. Help your coworkers when they need you, and they will be there when you need them. Have a sense of service. I know it sounds like a cliché, but if you help others solve their problems, the world will respond. You could go to a conference, read articles, read research, listen to podcasts, and attend in-services. Even better would be to create your own in-service if you have the confidence and skill to perform it. Treat each customer like a millionaire. Pretend like each customer is the richest, most influential person in town. Pretend the customer is the President of the United States. How would you treat him or her? Treat each customer like royalty and start earning compliments on day one. Over promise and over deliver. I’ve heard people say to under-promise and over-deliver, but why would you do that? Why would you want to tell someone that you can only do less than what you’re capable of? This is not only deceptive but you’re cheating yourself. If you want to get ahead, don’t be average or do what everyone else is doing. Don’t settle for average, settle for great. Average shouldn’t be anyone’s goals. Average standards lead to an average life. If you make a mistake, then admit it. Don’t make excuses. Don’t try to pass the buck. Even if it wasn’t entirely your fault, be a professional and assume that everything is your fault. We all make mistakes. There’s an abundance of information. You’re not isolated anymore. If you have an internet connection, you’re in business. You can learn wherever you are. Be intentional and pay attention. You only improve when you recognize a mistake and then take deliberate action to correct it. Pay attention to the skills you need to hone. If you’re in an outpatient clinic, maybe you need to review your soft tissue or manual skills. If you’re in home health, maybe you need to review tests and measures, or watch a couple webinars on documentation. Notice where you need to improve and where you need to make mistakes. Accept feedback from supervisors and other coworkers, if they’re honest. In one position, I was constantly getting feedback about my notes. It was annoying at the time because it took an hour to fix and correct them, but as a new grad this was invaluable feedback. Today I write better notes. Ask your school if they can give access to databases like ProQuest, CINAHL, and MedLine. You paid that school a lot of money. The least they can do is give you access. That way you can read articles online for free. If you don’t have a lot of time to read entire articles, then read abstracts. At least you know who’s doing research and what PTs are researching. The APTA has two weekly newsletters and a monthly publication called PT in Motion. Also read NewGradPhysicalTherapy.com and subscribe to their newsletter to stay informed, of course. PT has several excellent conferences each year. The major one is Combined Sections Meeting, which is traditionally in February. It changes location every year, giving you another opportunity to see the country. It’s an opportunity to meet other employers, see old classmates, and meet the manufacturers of the equipment you use. Next Conference is usually in June, and that’s when the Board of Delegates meets to discuss rules and regulations. Each section (13 total) of physical therapy has its own conference. There’s also the Ascend conference, which is more business-oriented. Follow your favorite clinicians and PTs on Twitter, LinkedIn, and Facebook. Social media have become a powerful weapon for entrepreneurs and physical therapists. Through social media, you can find videos, links, and recommendations, and know what others in your field are doing. Popular Facebook groups include Travel Therapists, Physical Therapists, and Doctor of Physical Therapy Students. You’re fortunate that you’re a travel PT in this day and age. Go back 20 years, and you would’ve been completely disconnected from everyone else. Imagine being in a small town with no internet connection and maybe a few TV channels. No matter where you are, you can be contributing to the profession and learning new skills. The internet has made location far less relevant than it used to be in the past. If you have an internet connection, you’re in business. At some point, you will have to decide whether to stay where you are or go to another assignment. Like everything in travel, there are pros and cons. Your decision will depend on what you value the most. You can leave a bad assignment. If you travel long enough, you will have a bad assignment, or at least a mediocre assignment. That’s one reason to choose 13 weeks and not 26 weeks. Every travel PT has a horror story, or at least one assignment that he or she would not choose again.If you don’t like your current assignment, then your last day can’t come fast enough. Your decision will be easier in this case, and you will simply leave. One advantage of traveling physical therapy is that bad assignments are temporary and if you don’t like them, you move on. As I’ve said before, at some point, you will have a bad assignment, or at least an assignment that you would prefer not to extend. You can see another location. If your goal as a travel PT is to see as many places as possible, then each 13 weeks, you can move to another state, or at least another area, and see and explore it. You will have to apply for another license if you cross a border, but you can make that as painless as possible if you follow my advice in Licenses.One point of traveling physical therapy is to see different parts of the country in a short amount of time. Choosing to stay longer means you won’t see as many places. This is true, but if you’re going to make less money by moving to another state, then it might be cheaper to take a vacation to that state, or take a long weekend and visit. If the difference in pay is $300-400/week, then over 13 weeks, you’ll make $5200 more working where you are now. If there is no pay difference, then your decision will be easier. You will not have to learn a new EMR again. Learning a new system is one of the worst aspects of travel PT. After two weeks, you get used to the process, and you don’t want to change the routine again. Of course, if you leave, you only get used to the next EMR in a few weeks. Not only do you know the EMR, but you know the process, and you’ve developed a routine. You don’t have to leave your coworkers and patients. You’ve developed rapport and relationships with your coworkers, and you don’t want to say goodbye. As I said in Disadvantages, saying goodbye is one of the worst parts of traveling physical therapy. If you choose to stay longer, you don’t have to say goodbye right now. You have a good assignment. Why bother leaving? You know the EMR, you like the staff, and the staff like you. You live in a good area. You like the place where you’re living. You like your recruiter. You’re comfortable where you are. It would seem crazy to leave. Personally I’ve left some jobs, and I’m not sure why. I was making good money and my coworkers all wanted me to stay. Was it worth leaving to see a new area of the country? Today, I’m still not sure. You will have more stability. When people ask me what I don’t like about travel PT, I say that I don’t like the instability. If you choose to stay for six months, instead of three months, you will not have to find another assignment, and you can delay the job search. You don’t have to have find another place to work, and learn a completely new system. Extending a good travel PT contract can be like having your cake and eating it too. You can have the stability of a permanent job, while also being paid as a travel PT.At least consider extending a good contract. If you abandon a good travel PT contract, and the next one is terrible, you will regret the decision. In the end, it depends on what your priorities are. If you absolutely want to see certain states or cities, then keep moving. But understand that moving has disadvantages. But that’s the game of travel. With travel PT, everything must be considered a trade-off. Accept the trade-offs. After traveling - what comes next? At some point as a traveling physical therapist, you will want to stop traveling and seek stability. That could be during your first assignment or your tenth assignment. Some people travel for one assignment, others enjoy travel PT for years. Again, it all depends on what your priorities are. If you have an ambitious itinerary, then you will travel for years. If your goal is to pay off your student loans, then you should travel until they’re paid off. Maybe your goal is to travel to find a spouse, and then settle. It’s happened before. I’ve met former travel PTs who stopped traveling when they met their spouses. They settled in the place where they met and they never left. You can apply for physical therapy licenses beyond the contiguous United States (or “lower 48,” as they are referred to). You can apply for licenses in Alaska, Hawaii, the US Virgin Islands, and even Guam and the Marianas Islands. Keep in mind that all of these locations, except Alaska, pay less, and you will probably have to rent a car to live there, which will erode whatever money you’re taking home. The only contract I’ve ever seen in Guam was in the school system. If that’s your forte, then apply, but you will make less, and you won’t be able to bring most of your possessions. Dubai, United Arab Emirates, and Doha, Qatar, are both becoming hubs of healthcare. Both cities are trying to become world healthcare centers. They have built state-of-the-art facilities to attract talent from around the world. As I write this book, neither I, nor my recruiters, have any information about working in the Middle East. I imagine they would not hesitate to hire an American-trained physical therapist. I’m sure a little research and networking could lead you to the right contact. Nobody travels forever. One travel PT who replaced me in one of my positions had been traveling for six years, and had been taking six-month contracts in the Pacific Northwest. As I said before, taking six-month contracts could be the best of both worlds: more stability while making the same pay as a traveler. There’s no rule that says that a contract has to be 13 weeks. You can negotiate more, and maybe a little less. Some employers might hesitate to do this because they would have to pay for a travel PT for 26 weeks. Most employers want to think that they’re only using a traveling physical therapists temporarily. They use travel PTs as a stop-gap, or a temporary solution, to their staffing needs. They only want you there as long as necessary. They’re paying a premium; they have a financial goal to reach, and they would love to turn you into a permanent worker. It doesn’t hurt to at least ask for 26 weeks, if you’re happy in your assignment. If they can’t guarantee it, then at least ask for an extension when the initial contract expires. Every employer I’ve had has offered either a permanent position, or at least an extension. Some employers know that attracting permanent workers is almost impossible, and would be glad to fill a position for 26 weeks. One additional advantage of the 26-week contract is that the recruiter might offer more pay in exchange for the longer contract. It’s less work for the recruiter, because he or she doesn’t need to find you another job in 13 weeks. Obviously the only downside is that you will be in one place for 26 weeks. If you have other places to see, then you will not want to stay for 26 weeks for a travel PT contract. Also, if the job turns out to be miserable, 26 weeks will be a long contract, and you will wish that you had negotiated 13 weeks. But even 26 weeks is not a long time, and people have suffered worse jobs for longer periods of time. Another option is to take 13-week contracts at first, see as many places as possible, and then start taking 20-26 week contracts (13, 20, and 26 weeks are not the only options. You can negotiate any number of weeks). In a few years, you could easily visit 10 different locations. The world is a large place, and you could travel for a lifetime and still never see the vast majority of the world. It’s like a buffet: accept that you will not be able to experience everything. Claim: Travel physical therapists make more money than permanent ones. Not all permanent jobs pay pennies. I’ve gotten offers for home health jobs that pay $100,000 with a signing bonus. Remember, you will have to pay higher taxes with these jobs. Assume a 33% tax burden (federal+state). If you take a permanent job, you can also work at another facility on the weekends to supplement your income. If you make $90,000 during the week doing home health, and then work eight hours in a local hospital or SNF on the weekends at $45 per hour, your gross income can be above $100k, but after taxes you will have $70-80k. If you’re a traveling physical therapist, you can make as much as $100k after taxes while only working 40 hours a week. I didn’t include taxes in the traveler column because most salaries are negotiated in terms of post-tax income, while most salaries for permanent jobs are negotiated in terms of pre-tax, or gross pay. As you can see, if you keep costs consistent, then you make as much $20,000 more as a travel PT, compared to a permanent job that pays $90k. Of course, the difference can be minimized if you took a traveling physical therapy job that paid $1500/week and only paid 40 hours and compared it to a full-time job that paid $100k (rural home health) and supplemented your income on the weekends at a hospital or SNF. In fact, you could make more in that case. The difference is even greater if you’re comparing a travel position in a low-pay state like Colorado, Hawaii, or North Dakota. If, however, you’re comparing a high-pay travel PT position in California (up to $2000/week) compared to a permanent job in a private practice (gross= $60-70k/year before taxes), then you begin to see a huge difference in income. In fact, the difference could almost be double. Claim: The only jobs for traveling physical therapists are home health and SNFs. Truth: You can get a job in any setting. The idea exists that travel physical therapists are only needed in rural SNFs and home health agencies. There are plenty of jobs in these settings, but don’t get the impression that, as a travel PT, you will live in no-man’s land and work in a facility by yourself. You can work in any setting, but you have to be flexible with location. I’ve been offered jobs in every setting, and I’ve even seen jobs that specialize in pelvic floor therapy, pediatrics, and neuro rehab. But every time I interview for a new position, I get offers in positions in a variety of settings and locations. The job you want might not be in location you want, and the location you want might have the job you want. Or maybe the recruiter you like more is offering a job that pays less or is offering a position that has too many disadvantages. As I’ve said before, traveling physical therapy is a game of trade-offs. Hard choices will have to be made. If setting is the most important factor in your decision, then tell that to your recruiters. Be flexible with location. Finding your dream job in your dream location in your dream setting might not be possible. You might have to work a few years to get that position. Give yourself something to look forward to. The bottom line is you can work in every setting you want in as little as 18 months. You can work in a different setting every three months and you will be a versatile PT! Instead of developing expertise in one setting, you will have a little bit experience in every setting. You will learn a lot, and you will figure out where you want to work when you eventually stop traveling to settle down. Claim: Some states pay better and have more opportunities. Truth: On average this is true, but lucrative contracts can be found almost anywhere. I wrote earlier that if money is your most important factor, then consider working as a traveling physical therapist in California, rather than other states. There are always plenty of travel physical therapy jobs in the golden state, and you’ll usually get higher offers, especially in Northern California. Other states, particularly Midwest states, pay less. This is a generalization of course. Your negotiation skills will also come into play. A good negotiator or a good recruiter can make more in the Midwest than a bad one in California. Home health and SNFs will pay better than inpatient and outpatient rehab. Don’t misunderstand me. You can make money anywhere, but you will have to be a savvy negotiator, and you might need to use the right recruiter to make a little extra money. I’ve heard of people making $2000/week in the Southeast. But, as a general rule, California, Texas, and most Western states will pay better than the Midwest and Northeast. In terms of opportunities, California is, without question, the leader. It makes sense to get a PT license in this state. At one time, one recruiter will have 10 or 20 contracts available. If you work with multiple recruiters, you could have access to 30 or more contracts. Any setting is available, and every location has at least one offer. It’s a large state and it’s the best market right now for traveling physical therapy. Other states are hit-and-miss, and sometimes only have one or two contracts. I’ve only heard of one contract in the state of North Dakota, for example, a state with just 700,000 people. But the cost of a license in that state will cost about the same as a license in California. Claim: You need to “hit the ground running” as a travel physical therapist. Truth: This is true for any position you take. I first considered travel physical therapy when I was in my final trimester of school and I was looking for the best opportunity. I remember another student said that the demands for travel physical therapists were higher than the demands for regular PTs. The belief is that the travel PTs are paid more and more is expected. To whom more is given, more is expected. I don’t think this is true, for several reasons. If you’re a new grad, most employers are going to understand that there’s a lot you don’t know. They’re not going to give you twice as much work as other PTs. Second, most employers will not pay more than 40 hours a week because you’re being paid more per hour than other PTs. Don’t expect to work 60 hours a week unless you really want to, or unless you find another job to supplement your income. Finally, now that you’re a licensed PT, you’re going to be expected to handle a full caseload. It doesn’t matter that you’re a travel physical therapist. If you’re working in an outpatient clinic, that means up to 15 patients a day. If you’re working in home health, it means six to eight patients a day. For inpatient rehab and SNFs, six to eight patients. For acute care, eight to ten patents. Don’t think they’re going to be working you like a pack mule just because you’re a travel physical therapist. Claim: You need experience to be a travel physical therapist. Truth: You don’t need any experience to travel. Another claim I heard when I was in school was that it’s best to have some experience as a physical therapist before you start traveling. Travel PTs often take jobs that are hard to fill, which means they’re more demanding, more challenging, and often in less desirable areas. The belief is that if you have experience, then you will be able to handle these situations more easily than if you are a new grad. The truth is that many new grads have decided to travel immediately after PT school. In fact, the majority of traveling physical therapists I’ve met are new grads who want to travel, see new places, get a variety of experience, and earn more money than if they would if they were permanent therapists. This doesn’t mean that all travel PTs are new grads. Some travelers are at the end of their careers, and want to travel after being permanent PTs for 20-30 years. Now the kids are gone, and it’s time to travel. It’s easy to say that you’re only going to work for one year and then travel. What happens is that you get comfortable in one spot, you meet a boyfriend or girlfriend, you like your job, you like the city you live in, and then you decide not to travel. It’s hard to get comfortable and then leave. I feel that the ideal time to travel is as soon as the graduation ceremony is over. I don’t know anybody who took a permanent job and then decided to travel. The typical trajectory is graduation, travel, and then permanent job. Logistically it’s easier to start traveling right after graduation. Why would you settle permanently in the first place, and then start a new life again? In fact, why make less your first year on the job than you could as a travel PT? If you don’t get comfortable, you won’t know any better. Claim: You can travel anywhere. Truth: Yes, but some places are easier to find a job than others. Once you pass the NPTE, you will be able to apply for a license in 50 US states, the District of Columbia, US Virgin Islands, and Guam. Of course, you will have to apply for each of these licenses separately, a process that can be greatly expedited if you follow the advice in Getting a License. Yes, there are jobs in each of these locations, but some locations have more choices than others. Guam has one contract in the school system. I would highly surprised if Washington DC had a single contract. Some Midwest states have one contract in the entire state. Hawaii probably has two or three contracts, but the pay is significantly lower and cost of living higher. California has at least 30 contracts at any time. If you apply for a license in Nebraska, but there are only two contracts available, do you take one of those contracts or a better one in California, even though you’ve already been to California? Your choice. Claim: You can’t get time off as a travel physical therapist. Truth: You can, but you need to arrange this before the contract is signed. More than once, I’ve heard that travel physical therapists can’t take days off during a contract. In fact, you can get time off but you have to specify which dates you want off when you negotiate the contract. If there’s a wedding, a conference, or a vacation somewhere in your contract, you need to tell the employer and the recruiter before you sign that contract. I’ve taken an entire week off, and I’ve taken Mondays and Fridays off because I had a special occasion on the weekend. The only disadvantage is that, once the contract is signed, you can’t take any additional time off. If you need to take off an additional day, make sure it’s absolutely necessary. But you have to be able to look at your calendar three to six months in advance and see which days you want off. I recommend you take off at least one day a month, especially in months like October and March without any national holidays. That should give you more time to explore the area you’re in. Most recruiters offer PTO, but you have to work 12-13 full weeks (or 400-500 hours) before you get a single day, so PTO is not as generous for travelers as it is for permanent workers. If you change recruiters, then the PTO doesn’t roll over to the next recruiter. That’s one advantage of working with one recruiter. One advantage of traveling is that, at the end of every contract, you have the option of going to the next contract immediately, or taking a few days off for vacation. I’ve used every break between positions to go see family. Every contract has a specified end, unlike permanent PT positions. 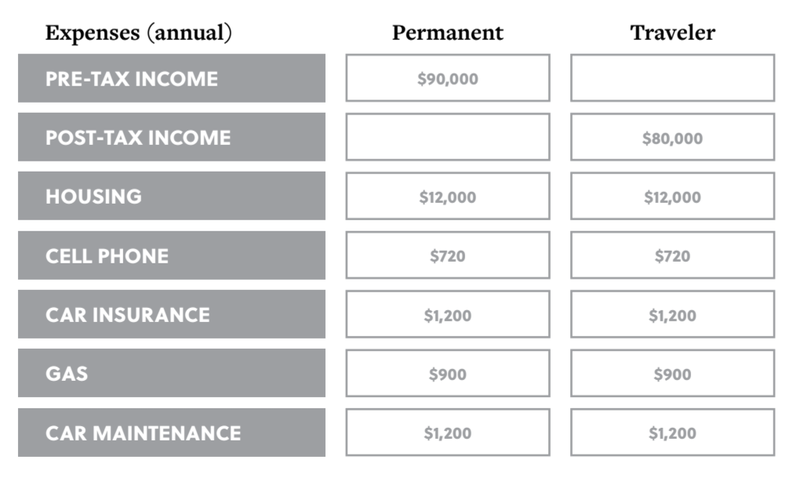 Having a permanent job doesn’t guarantee more PTO. Some employers don’t want PTs to take time off during the busy season, or when other PTs are taking time off. In one case, I extended because all the other PTs wanted time off in the month of August. It turned out to be my best assignment. Had it been a horrible assignment, I would not have stayed. What mistakes have you made as a traveler? What would you do differently? "Two big mistakes I have made as a traveler. 1) When you are interviewing for a job, be sure and interview them as well. I have taken a job before without really asking many questions about the actual position. When I got there, I realized I was seeing 20+ patients a day and mostly just evaluating. Be sure to ask what will be expected of you, if you are hired for the position. You don’t want to be miserable for a whole contract! What are the pros and cons of travel PT? Learning different types of treatment with all the different therapists you encounter. How do you negotiate pay for traveling physical therapy contracts? What are some myths of travel physical therapy? “Myth 1: It is hard to get outpatient ortho assignments: This is not true. I have been doing travel PT for 2 years. I am on my 5th assignment and every single one has been outpatient ortho. What questions do you ask during travel PT interviews? What is your best advice for travel physical therapists? “Tip 1: Talk to multiple travel physical therapy companies when looking for a new assignment. Tip 2: Do not let the travel physical therapy company find you housing. You will come out much better if you take the housing stipend and find your own housing. Same goes with health insurance. I have found that getting my own health insurance and taking their stipend is much better. Tip 3: Don’t be afraid to say no to a contract. Most recruiters will try and make you feel like you are obligated to take the assignment after you interview with the contact. If you did not like the sound of the clinic during the interview, then tell them no. You don’t have to go to any assignment until you sign the contract. How do you find travel PT housing? “There are Facebook pages for travel professionals. I always go to these and someone will help me out. I also have used Facebook; you can actually find great people this way. Just be safe and weed out the weird.” - Chrissy Huxley. How do you select a recruiter? What are advantages and disadvantages of using a travel physical therapy recruiter? They already have connections at many clinics around the US so they will be able to offer you a long list of jobs in a given area. Which states should traveling physical therapists work in? How do you facilitate the licensing process? What are some things you wish you had known before you started traveling? “I wish I had worked with multiple recruiters from the start.” - Bryan Hill. I did not write everything in this book. I solicited contributions from other travel physical therapists, a social media expert, travel physical therapy recruiters, and even a couple of financial advisors who assist physical therapists. I wanted a complete book, and I didn’t want to shoot from the hip, so to speak. The Six-Figure Traveler should be the most comprehensive resource on travel physical therapy. I wanted to get the perspective of travelers, but also the recruiters who work with them. Each side has a different experience. This book includes contributions from other travelers, other physical therapists, and even recruiters, all of whom I know personally. Will Butler - Will is a physio by training and helps clinicians with financial planning by choice. He is motivated by human potential and past misfortune. His mission is to change healthcare by improving the life of the clinician through education and financial planning. He received his DPT from the University of St. Augustine. He enjoys few things more than Ben & Jerry’s ice cream; helping clinicians succeed is one of those things. He values humor, knowledge, and building lasting relationships. Brianna Bean - Brianna Bean, the creator of Therapy Scout, is a graduate of University of South Florida with a Bachelor’s Degree in Communications and a Master’s Degree in Entrepreneurship from the University of Florida. April Fajardo - April obtained her DPT at Southwest Baptist University (SBU). She has served on seven international service learning (ISL) trips. She currently serves as the PT Day of Service Global Affairs Chair, serves on the Academy of Neurologic PT's Membership and Public Relations Committee, serves as Move Together's Director of Communications, and serves on the American Physical Therapy Association's Early Career Team. She is the author of The Vagabonding PT. Dr. Ben Fung, PT, DPT, MBA - Ben is COO and CoFounder at UpDoc Media, a digital media & marketing company that specializes in physical therapy. Dr. Fung received his DPT from Azusa Pacific University and his MBA from the University of Michigan. He currently lives in sunny San Diego, California. He loves all things Disney and Star Wars, is a humble student of Brazilian Jiu Jitsu, likes to cook, loves to eat, and is driven by mutual growth and accelerated success. Bryan Hill - Bryan graduated from PT school in 2014 and has traveled since then. Traveling physical therapy has allowed him to work and play in California, where he has taken multiple assignments in that state. He specializes in orthopedics. Chrissy Huxley - Chrissy is from Florida and graduated from PT school in 2014 and immediately started to travel. She started in Oklahoma, and then went to Texas, and now works in South Carolina.</li. Veronica Perez - Veronica went to school at University of Nebraska at Omaha, before starting at Aureus Medical. She has been working with Aureus for going on four years now. She is also Team Lead for the Therapy recruitment team. She enjoys helping others and her way of helping is offering career advancement. She is married, has a husband and a beautiful one-year-old boy, Henry. Cedric Schales - Cedric is from New Iberia, Louisiana, and graduated from PT school in 2015 and has worked as a traveler since then. Cedric spent his first year at a state facility in Abilene, TX. After I finished this ebook and everything was ready to go, I realized that I had some extra information to add. Here's what I've learned since I first completed this book in Spring, 2017. Want this as an ebook? Download below!